Continuing with the tale of the second annual “Campushetach” trip offered by my department at Bar Ilan University, we begin in a communal tent in the yishuv of Susiya. 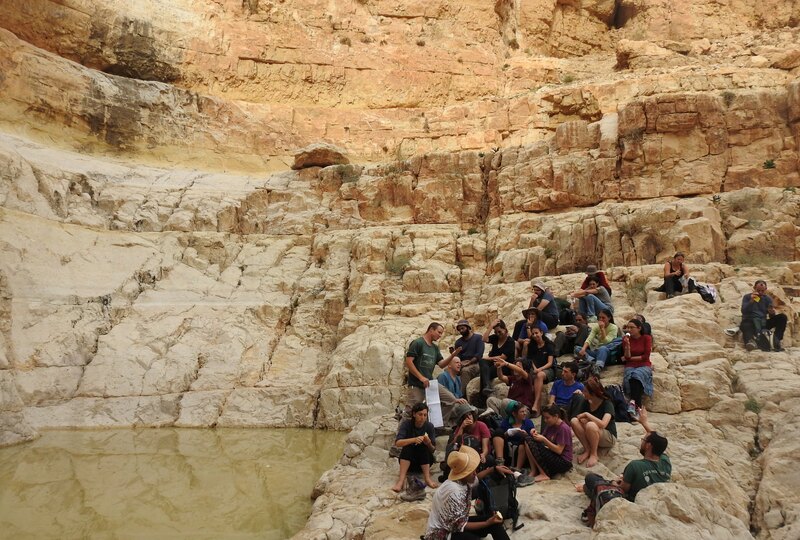 A group of students and faculty alike, we had spent the previous day being shuttled around the Mount Hevron area, seeing sights and then hiking down Mount Amasa. We were awoken the following chilly morning and hurried along to pack everything up on the waiting bus. The first and only stop of the day was to a parking lot of sorts located on the far side of a Bedouin village of e-Dahabshe, where we were to disembark and spend the day hiking. Arriving just as the local gaudily-dressed Bedouin children were making their way to school, we got out of our tour bus and sleepily looked around. Thankfully, there was quite a lot of songbirds chirping and flitting about, and I was immediately awakened. Adam and I huddled together as we struggled to make out different species, some of which were ones that we had never yet seen. No matter where we looked, there were little birds moving about, feeding in the early morning light. Highlights included desert finches, linnets and a bunch of desert larks. It was only the necessity to stick with our group that made us continue on, leaving behind an unlikely birding paradise. It wasn’t a far walk to the first stop of the hiking trip, Horvat Uza, where the department patron Yehuda Mizrachi was setting breakfast up. Always with crowd-pleasing tricks up his sleeve, this time he brought a gas taboun to make fresh pitas on. Breakfast was quite the feast, and when we had all eaten our fill, the lectures and hiking continued. Dr Shawn Zelig-Aster lectured from the eastern side of Horvat Uza, as we sat on the ruined walls and stones of the ancient fortress. 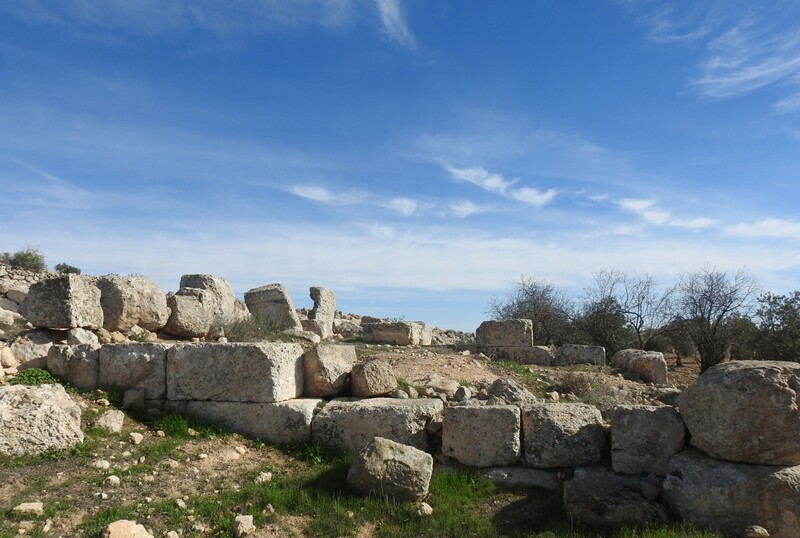 Surveyed in the 1950s, Horvat Uza has been identified as an Israelite fortress dating back to the Iron Age, built of a curious blend of limestone and flint. The dark, rich colours of the semi-translucent flint blocks made for quite an interesting sight, especially when gazing upon rows upon rows of ruined walls. As expected, my attention was shortly arrested by the appearance of little birds popping in and out of sight. Sitting at the edge of the slope, I was able to spot and photograph a whole slew of songbird species, including: blue rock thrush, blackstart, black redstart, desert lark and mourning wheatear. When we finished at Horvat Uza, and had properly examined the multiple rooms, we continued along the trail and began a quick descent. To the east a parade of camels, trailed by a donkey-riding Bedouin and a dog, came into view, the first of many camels to be seen that day. Climbing back up the opposing slope, we began the slope-side trail over the dry streambed, enjoying the narrow, rocky path and the vast, rocky desert view. 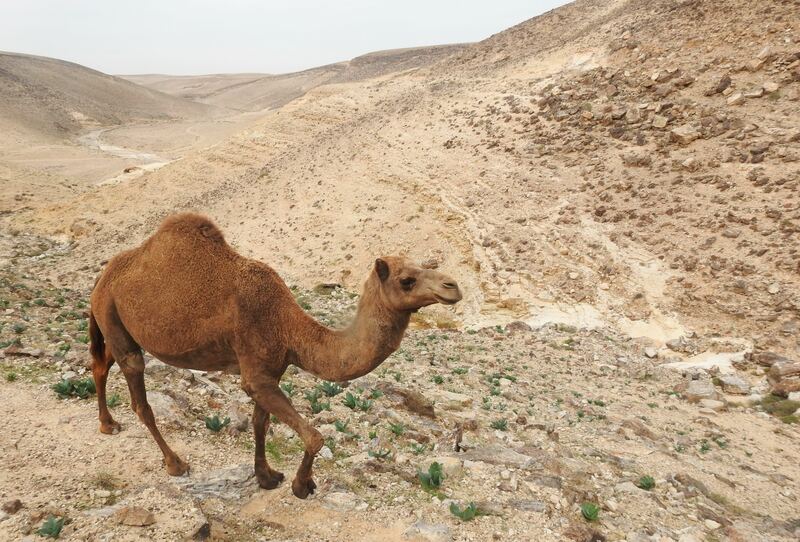 This hiking carried on for an hour, with camels, a faraway fox and more birds, until about noon when we dropped down into the predominantly dry Nachal Kina. Due to the previous week’s rains, there were sporadic pools of water dotting the rocky streambed, brown from the large amounts of dirt. We continued along the trail, heading upstream, enjoying the loud calls of the Tristam’s starling and the occasional presence of a rock martin or two flying overhead. 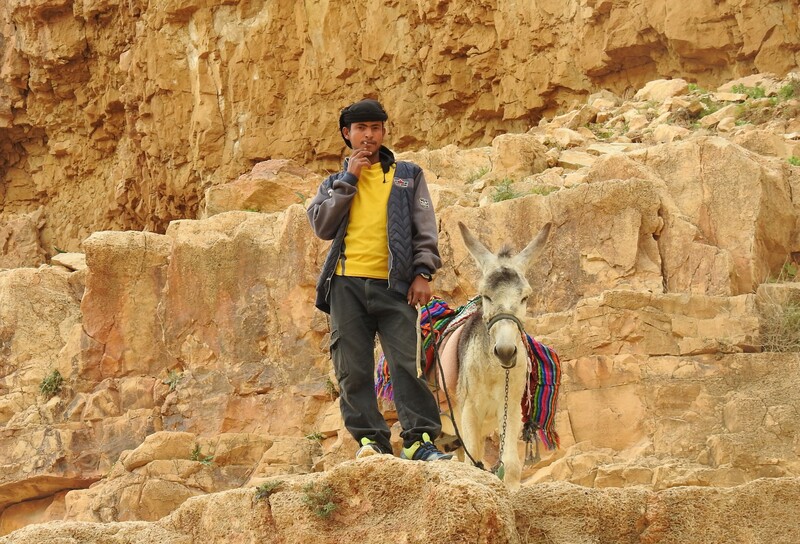 Somewhere along the way we encountered a Bedouin man on a donkey with a small herd of goats and a couple dogs. He was enamoured by our presence and followed us faithfully from the slope, playing trance music on a portable speaker to enhance our hiking experience. It was quite interesting and most unexpected. An hour and a half later we arrived at the dry waterfall, where a deep pool of water awaited us. Most of us just gazed at the murky waters and found a comfortable place to sit down, but not Dr Avi Picard – he casted off his outer clothes and dove into the water. As he splashed about, and the rest of us enjoyed the break, a few bold blackstarts and the trance-playing, donkey-riding Bedouin came to join us. 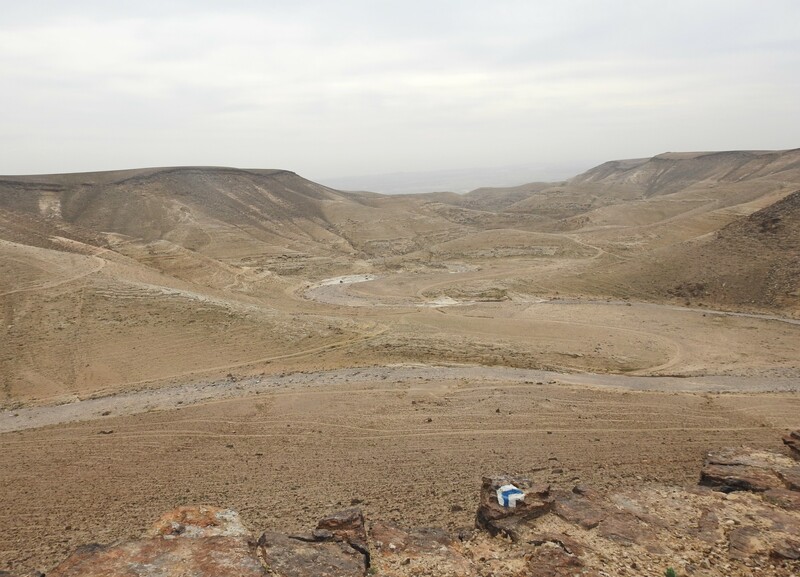 Next, this other Bedouin guy named Suliman came down from the ridge and began filling up his coffee pot with the dirty pool water. When we talked to him we learned that he actually came to this pool to gather water to take back home, because he believed that the water was better than what he’d get ordinarily. Needless to say, it was a very interesting experience beside that muddy pool. 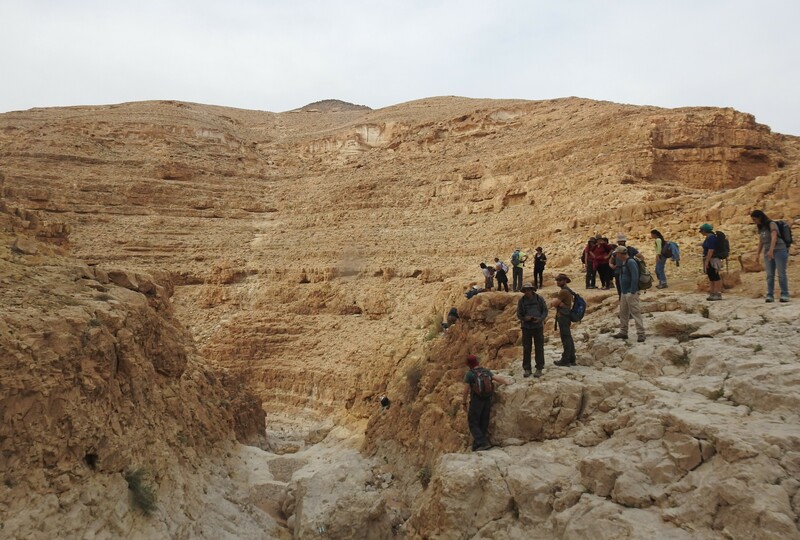 Climbing out from the base of the dry waterfall, we walked the upper area of Nachal Kina, which was even drier and contained less rainpools. We walked and walked, enjoying conversation as we made our way to the base of the mountain where we had stopped for breakfast. On approach, we stopped briefly to examine three curious water cisterns, one of which is still in use today. Several ravens passed overhead as we climbed back up the slope towards Horvat Uza, where I paused to examine some thorny saltwort growing beside a large rock. When we arrived at the curious flint fortress we found Yehuda Mizrachi with food spread out for lunch. We sat our weary selves down and feasted on breads, salads, cheeses and more, while fresh hot pitas and calzones came off the taboun. At the end of the meal, Prof Lilach Rosenberg-Friedman, the department head, gave closing remarks and we began the short hike back to the waiting tour bus. The sun was beginning to set as we head out, bringing a close to a very successful and fun field trip. But it wasn’t completely over, as Adam, Ben and I were to meet some friends back at the university for pizza, and only then bring an end to the very long day. 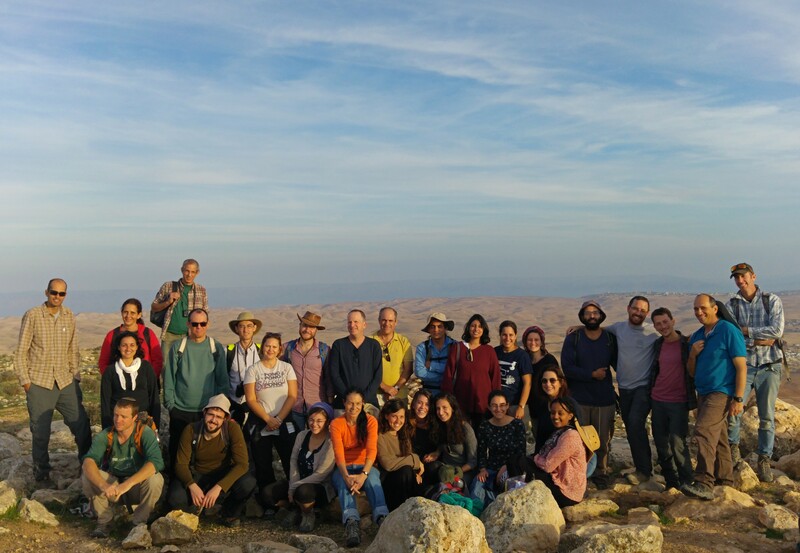 The other week I participated in the annual two-day hiking trip (known as the “Campushetach”) provided by my Land of Israel Studies and Archaeology department at Bar Ilan University. 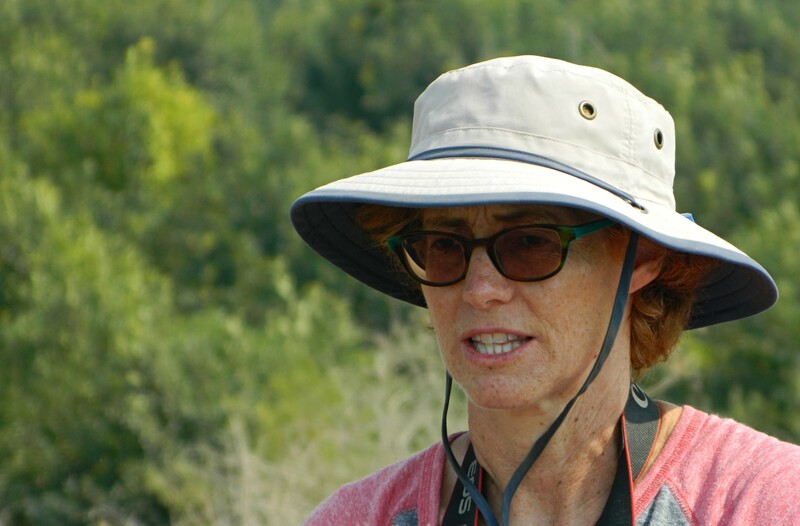 Geared towards relatively fit hikers, this trip takes a rugged approach to geography, history and archaeology and is offered to both students and staff of the department. 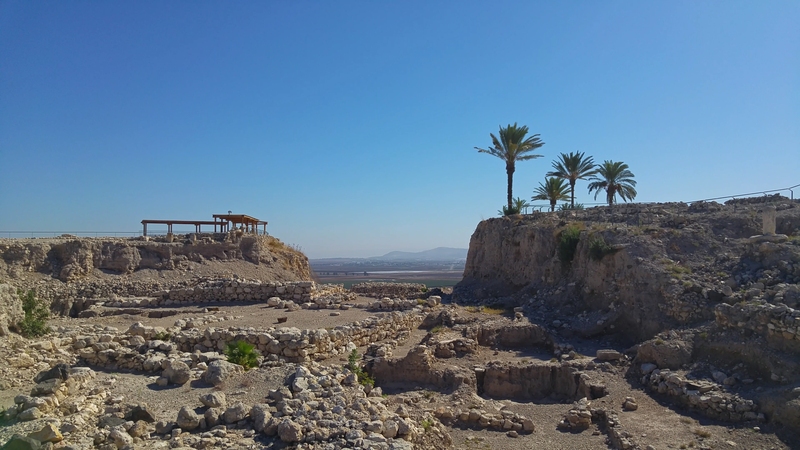 Last year we spent two days in the Wadi Qelt area (posts I and II), and this year we spent the two days in two different places: the first day in the Mount Hevron area, and the second day at Nachal Kina in the Negev. The first day began at BIU where the majority of us boarded a tour bus to be taken to the Mount Hevron area, making a few stops on the way to pick up the other trip members. 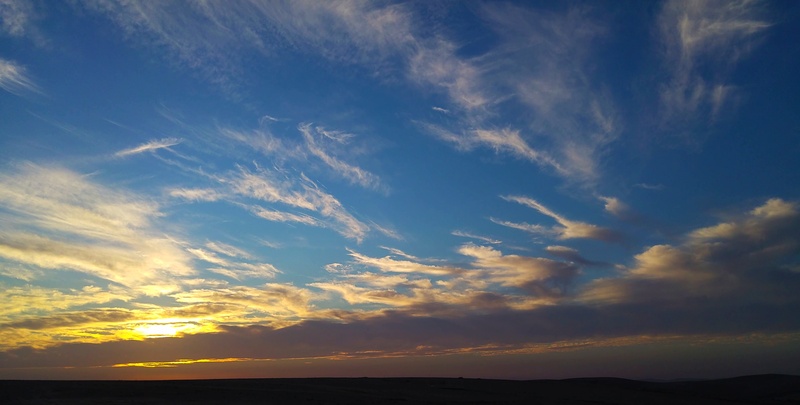 We drove through the Judean Lowlands, spotting some gazelles on the side of the road, and then entered Judea. We passed by Hevron and had our first real stop at a site called Nabi Yakin, home to a burial cave and Muslim maqam (shrine), as Dr Dvir Raviv gave us the trip’s introductory talk. 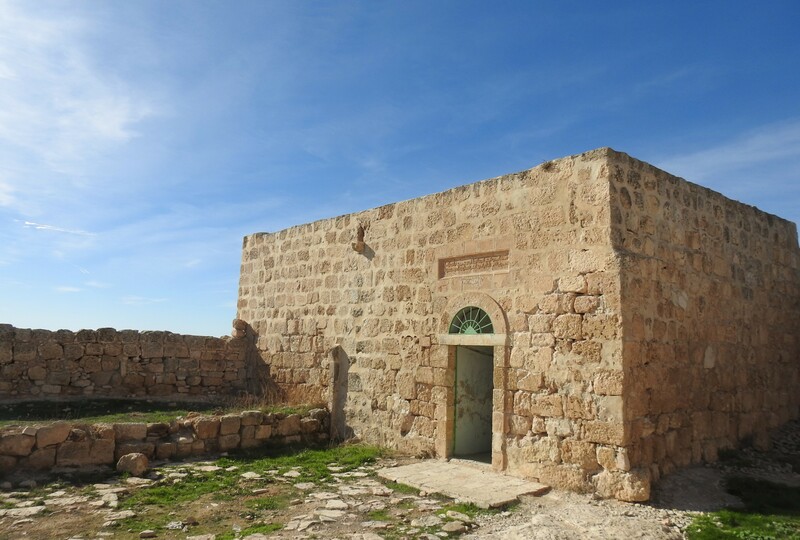 The maqam, known as Nabi Yakin, was built to house a pair of “footprints” in the bedrock, which, according to Muslim belief, belong to the patriarch Abraham. Outside the maqam, surrounded by stones, is another pair of “footprints” that are associated with Lot. A quick visit inside the burial cave revealed a whole lot of collapsed rock and a lone Sinai fan-fingered gecko that was hiding out near the painted gate. Back outside, blossoming Steven’s meadow saffrons dotted the ground here and there. 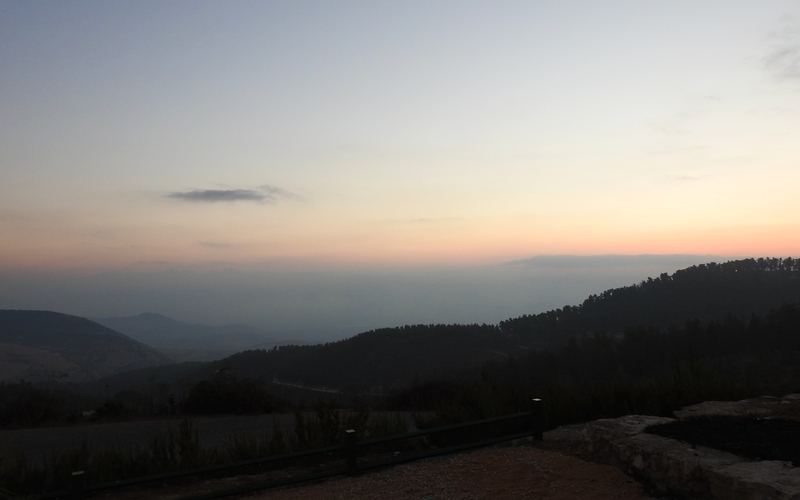 Our next stop was to the yishuv Ma’ale Hever where we enjoyed the lookout and had breakfast. F-16 fighter jets screamed in the skies overhead, dropping flares as they engaged in exercise maneuvers. 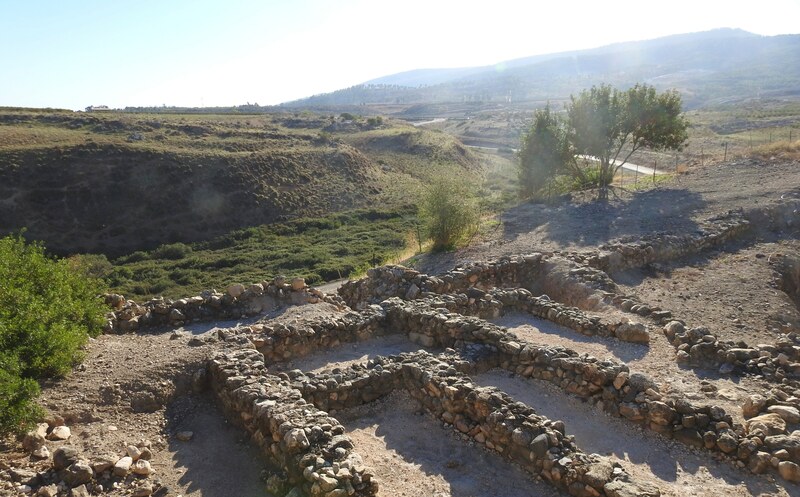 From the yishuv we drove over to Tel Zif, where we had a short walk to some recently excavated Roman ruins. 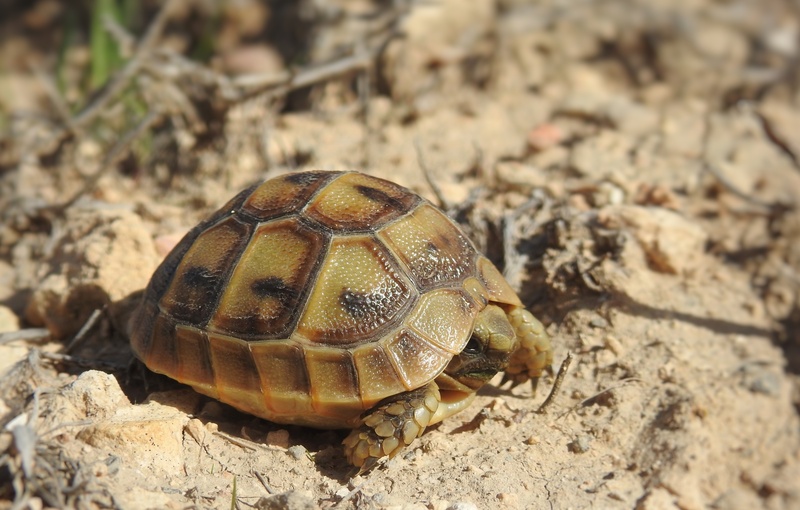 There was also some interesting wildlife to be seen, including some ravens flying in the distance, a flock of woodlarks, a baby tortoise and my very first Ameles heldreichi praying mantis. 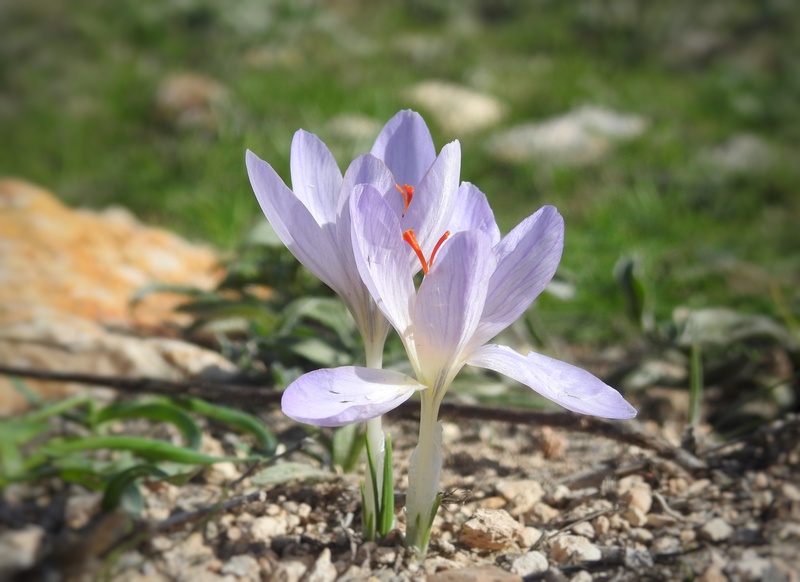 In addition, a nice bunch of Crocus pallasii was flowering and providing nectar for a hungry honeybee. The ruins at Tel Zif are quite fascinating, with the Classical architecture of fine masonry with a fancy tiled floor and carven columns. Heading back to the bus after some final photographs, we were then driven to the access road to Tel Ma’on. We disembarked and began the walk to the tel, where we were to enjoy the views and the site of an ancient synagogue dated to the Roman era. 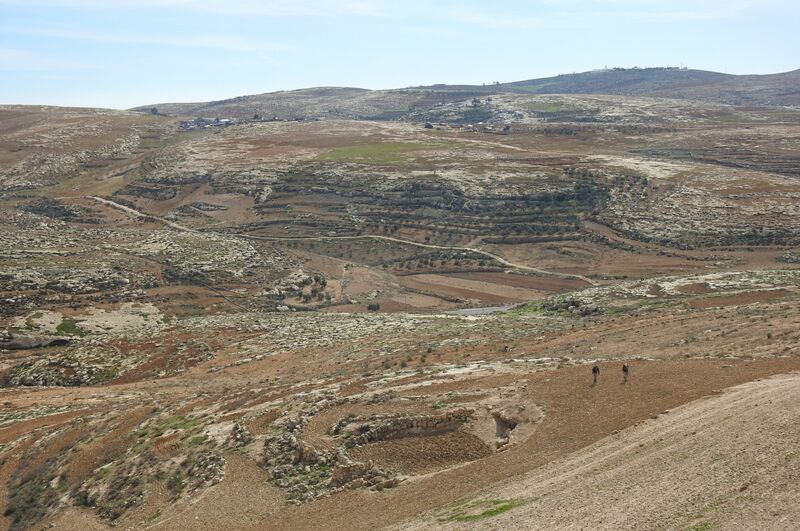 Accompanied by a trio of soldiers, we entered the Arab settlements and passed plowed fields and ancient water cisterns. One of the cisterns we passed is still in-use, with a couple local children standing over it and the nearby sign of rehabilitation on behalf of the Canadian government. 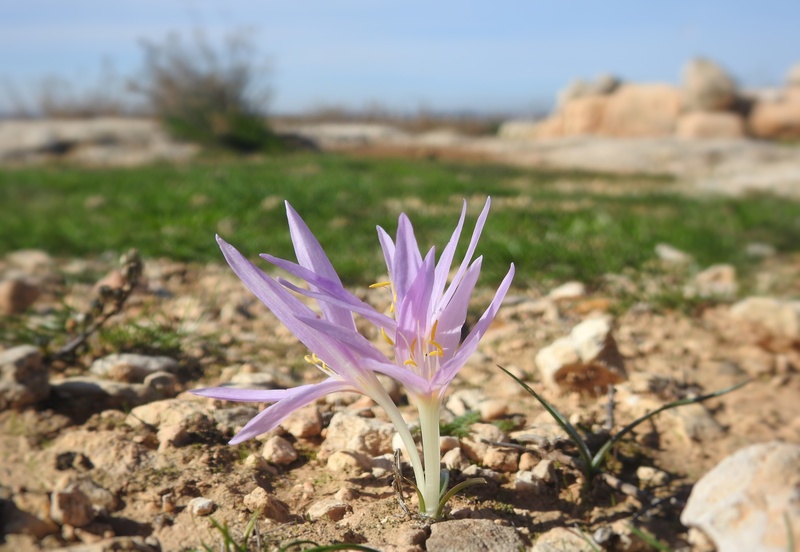 At one point up the slope, someone noticed an interesting flower – identified as a Tuvia’s autumn crocus, and then my friend Adam captured my attention. Off to the east there were two large shapes flying through the air. Seeing the rear one relatively clearly, I assumed the other to be the same species – a common northern raven. 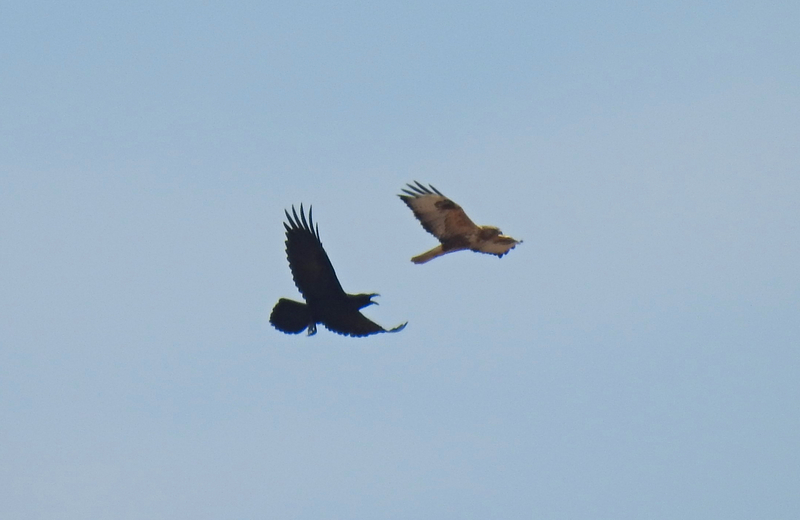 Only with the help of my camera’s 83x zoom was I able to get a series of photos which showed me that the raven was chasing (or mobbing, as it is known) a long-legged buzzard. Up at the lookout atop the tel there were more interesting birds, including a male black redstart who lingered in the nearby trees, giving us quite the show. On the north side of the tel, just below the top, we came across the ruins of the ancient synagogue. There wasn’t too much to see but the remains of a few walls and a partially collapsed escape tunnel/chamber dug out of the bedrock. Continuing back down the slope via the western side, we amassed a large number of curious local Arab children who began to follow us on our way out. Another set of ruins, this time larger walls of well-dressed ashlars, intrigued us, but unfortunately we were on a tight schedule and didn’t stop. Back on and then off the bus, we stopped at the yishuv Susiya for lunch and a break, and then back to the bus to be driven to Mount Amasa. For the past year or so I’ve wanted to visit Mount Amasa, largely due to a video I saw of it filmed by Amir Balaban (see HERE). 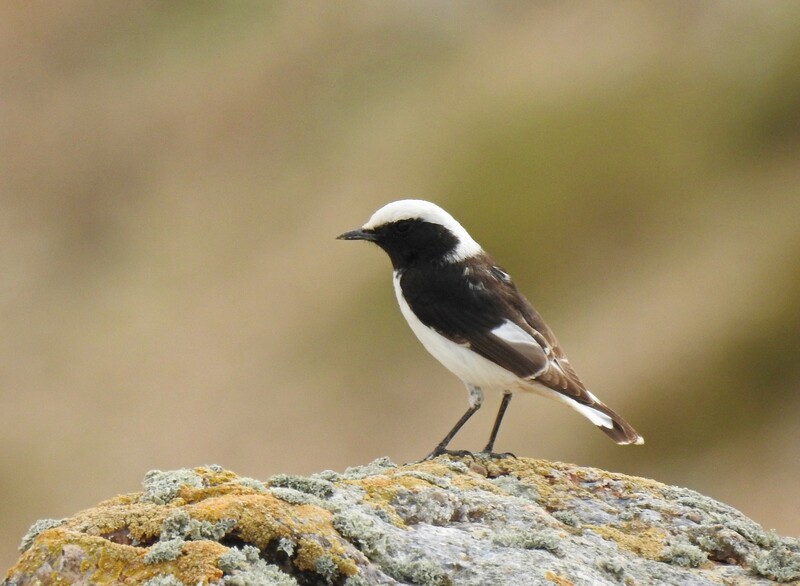 Last winter a Persian wheatear, a rare bird for Israel, had been spotted and scores of birders sojourned to Mount Amasa to see it. This year it returned, and while the excitement has died down, I thought it’d be fun to spot it. Alas, no Persian wheatear was spotted, but a great number of other interesting birds were. From the very moment we stepped onto the trail, part of an ancient Roman road, Adam and I saw birds everywhere. There were stonechats, wheatears, chukars and crested larks galore, and it was hard to keep up with the group’s unconcerned progress. 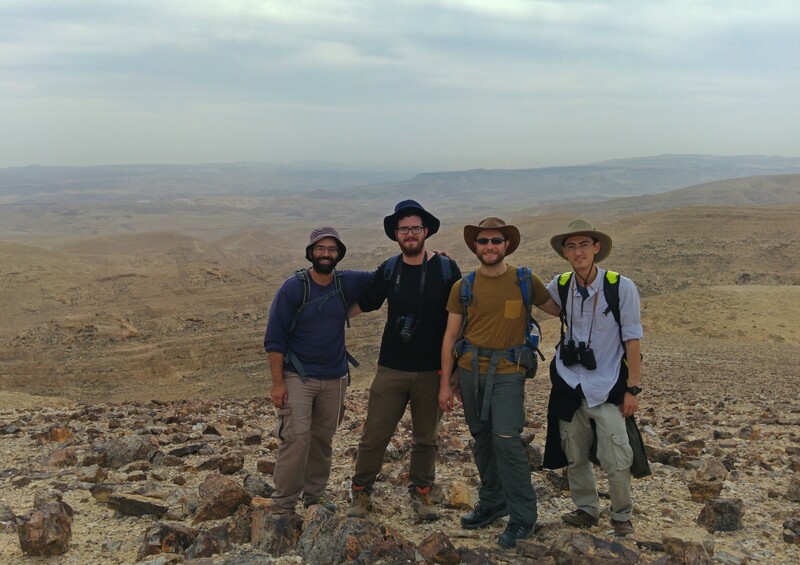 At the peak of Mount Amasa, a very gently-sloped mountain, we were gifted with an incredible view of the Arad Valley below us. After hearing from a couple of the lecturers we began the long and slow descent towards Nachal Dragot. The sun began to sink behind the nearby ridge and the 6 kilometre long walk seemed to go on forever – which, in some ways was most excellent. It was a lovely hike and I look forward to returning one day and possibly even camping somewhere on the mountain. Passing an enormous quarry on the western side of the slope, we at last reached the near bottom and then cut across to find our bus waiting faithfully for us on the access road. 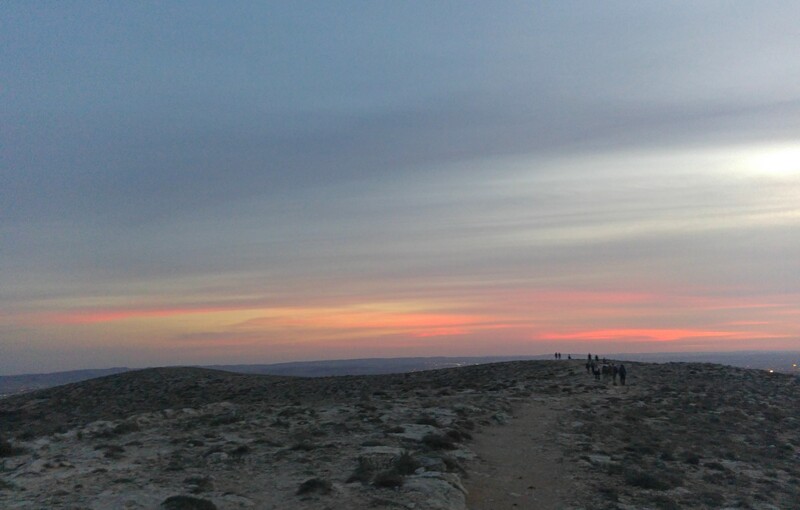 We boarded and made our way to Susiya, where we were to spend the night in a large, separated communal tent. Dinner was pizza and fresh soup made by the department’s patron Yehuda Mizrahi, and then we all enjoyed some relaxed social time. Friends Ben and Adam joined me on a small walk around the yishuv (where we saw a fox) and then got a bonfire going back at our home-base. Staying up a wee later than we should have, we eventually got into our sleeping bags and passed out, only to be woken up a few hours later for the second half of the annual “Campushetach”. 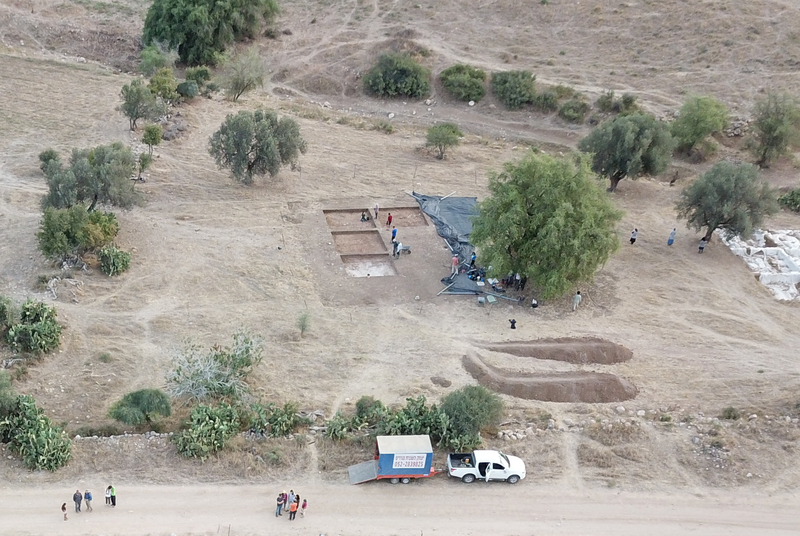 Harkening back to the warmer days of summer, this post chronologically follows the one-post summary of the month-long excavation season at Tel es-Safi. 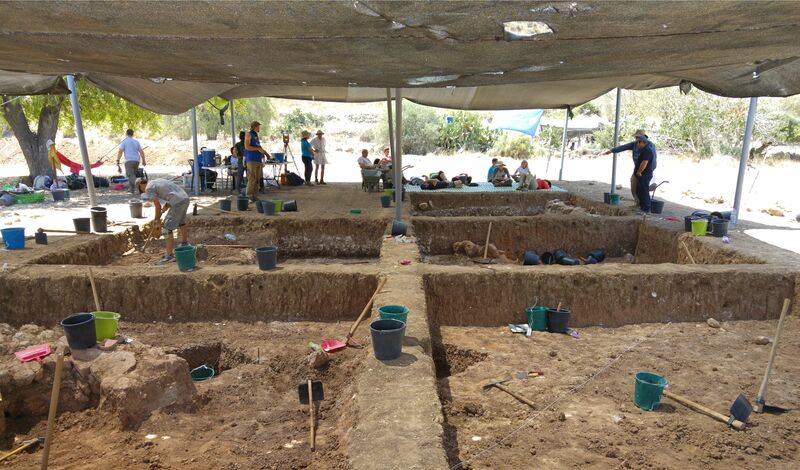 Finished with the Bar Ilan University dig, the members parted ways – some to see each other again next year, and some not. 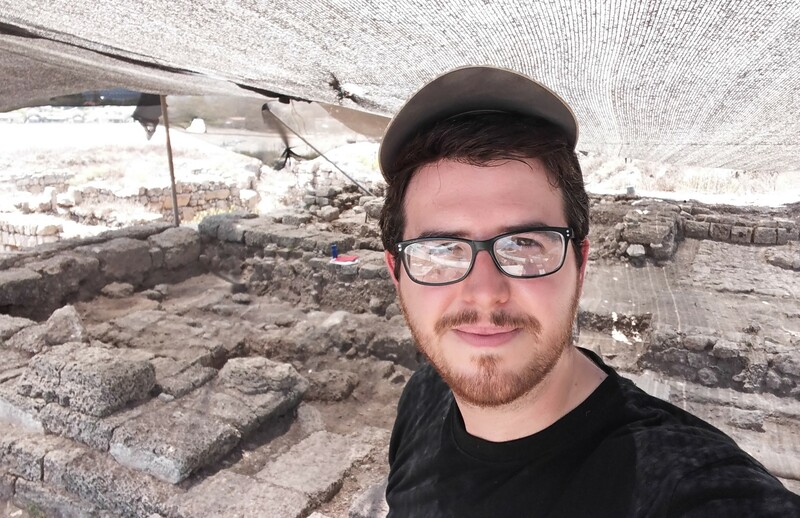 I was beginning the period of summer exams at BIU, which is always a dreary two months, so when the opportunity to attend the Tel Dor Archaeological Dig presented itself, I was quite excited to join. 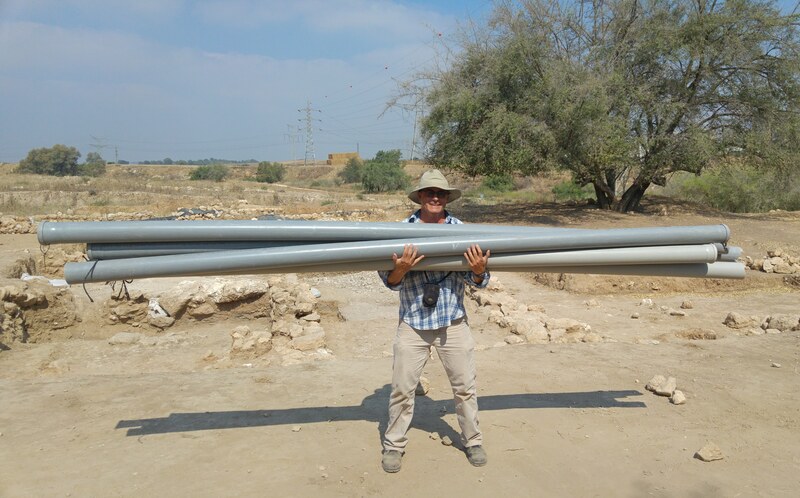 My brother Nissim had excavated the previous year at Tel Kabri, and this year found himself attached to the Tel Dor crew, so I had yet another reason to attend. 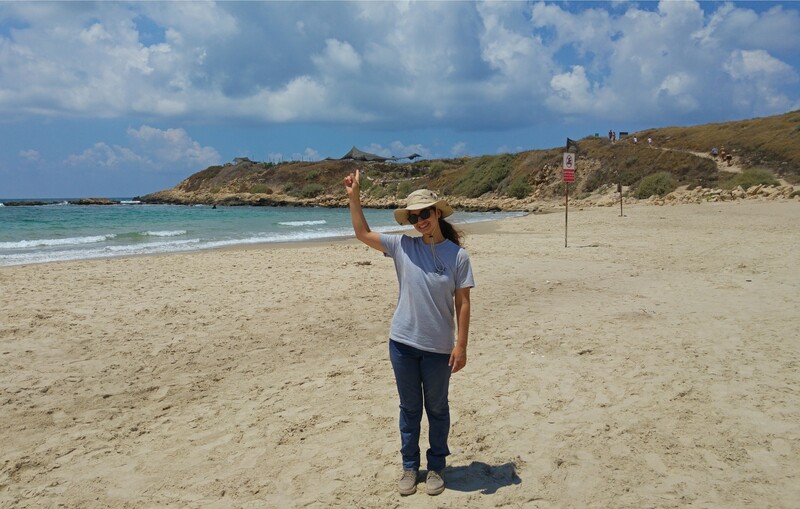 Joining me on this day of volunteering was Rebecca Zami, a two-year veteran of Tel es-Safi, who had just finished up a week of lab research at BIU. 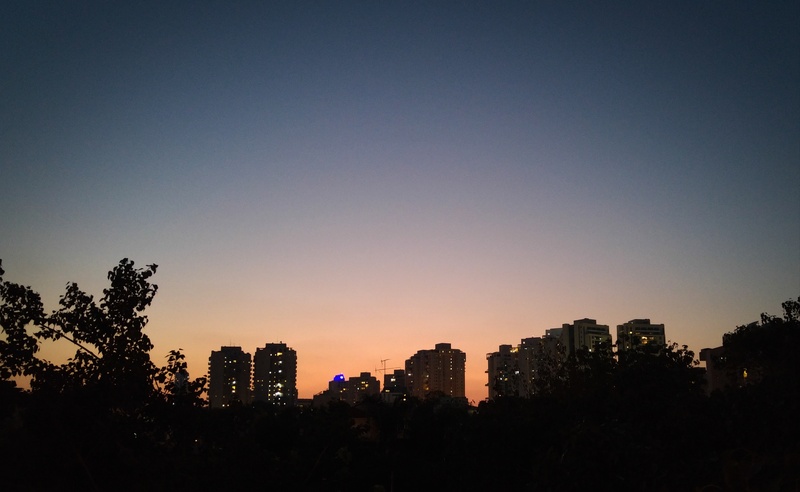 We set out in the early morning from Givat Shmuel and made our way north by way of public transportation. Nissim and a staff member found us at the junction closest to Tel Dor, and we made a quick stop at the Mizgaga Museum for some supplies before heading to the tel. I had already visited Tel Dor a couple time before, but each time I’m taken aback by the great beauty of the ancient site. 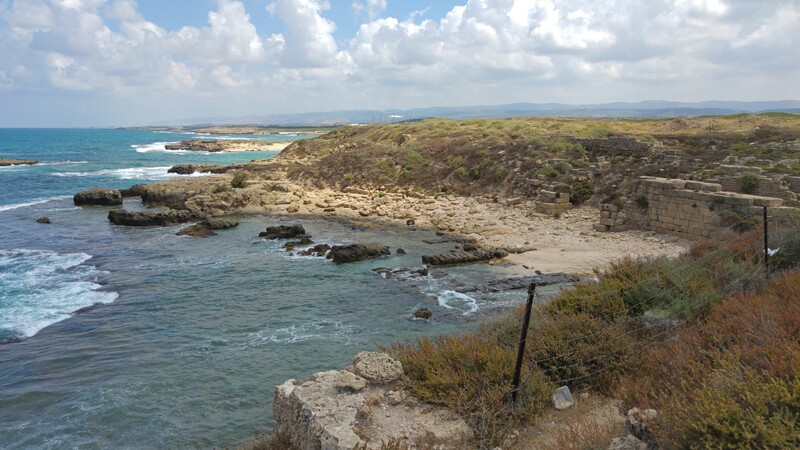 To see the excavated ruins on the hilly ground overlooking the sparkling Mediterranean Sea is delightful. As such, I was eager to get more acquainted with the city, and the ongoing archaeological excavations. 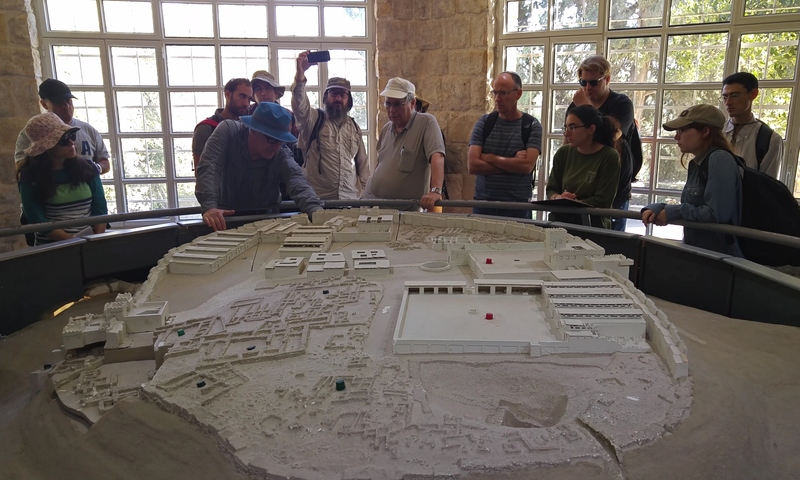 Rebecca and I presented ourselves to Alex and the rest of the on-site senior staff, a blend of representatives from Hebrew University, Haifa University and Boston University. During breakfast, we received from field supervisor Alex of BU a quick overview of the site, the area we were to be digging in and the people involved. Our first task, after getting our gloves on and equipping ourselves with the necessary tools for the job, was to clear away a “robber’s trench” beside a Classical column base (which the team dubbed “Colin”). Just to elaborate, a “robber’s trench” is a void in a wall where the original stones were removed from, not quite as exciting as it might have sounded. We were introduced to the junior staff member attached to this area and began the task at hand. 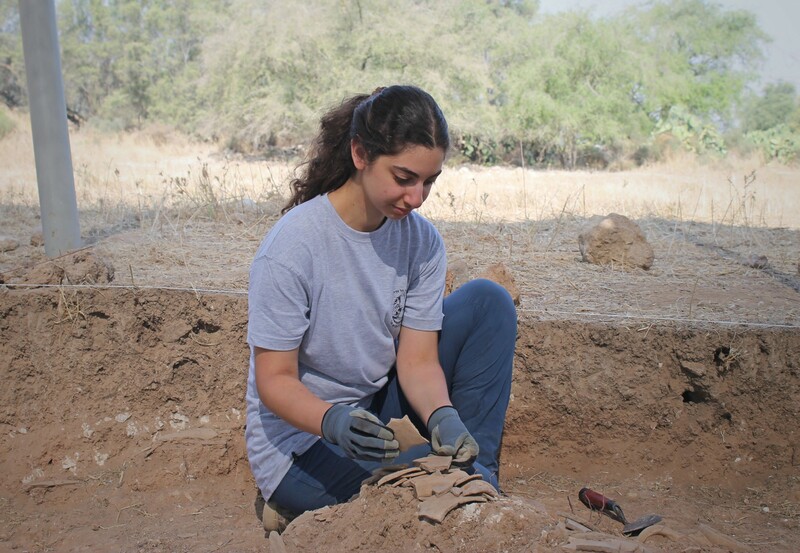 After a month at Tel es-Safi’s Area Y, where we found barely any pottery, it was exciting to find large sherds just hiding centimetres below the visible layer of dirt. Rebecca and I scraped and scraped at the loose brown earth, filling up buckets of both pottery and dirt. We had even found some shell fragments and a few plain tessera (small cubed mosaic stones), but nothing too exciting. Before long some more volunteers showed up, and we were re-purposed to a more physically demanding task. There was a monumental Hellenistic wall complete with a surviving edge of thick plaster that had been built up during the Roman period. Due to the fact that the Roman addition was situationally unimportant, we were tasked to remove the stack of dirt-lined stones that composed the later wall piece. This job seemed more exciting, and after just a few minutes we realised that it truly was. 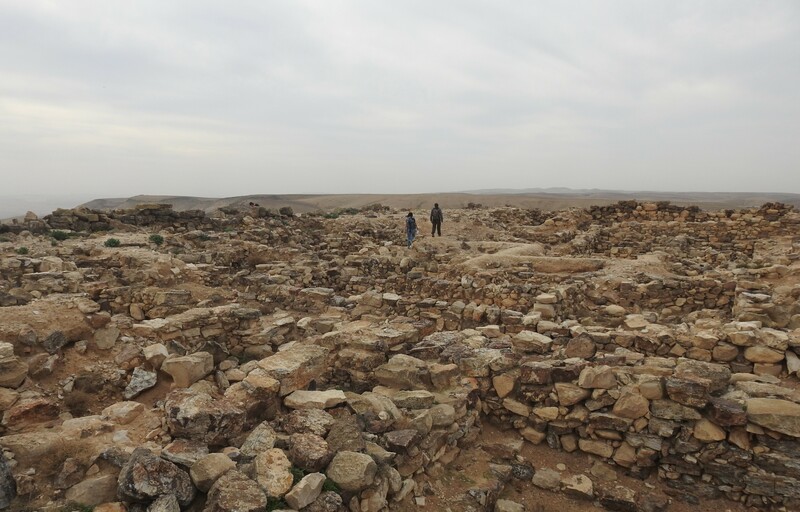 We scraped the dirt from between the stones, loosening them as well as revealing tons of potsherds, and then extracted the stones for Nissim to carry off to a dumping pile. 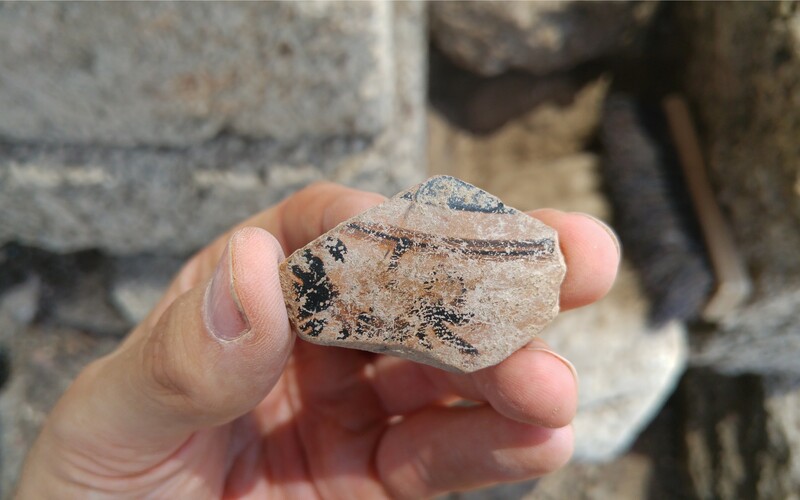 While potsherds are generally the most common find for archaeologists, we had gone so long without finding much that each piece found in this Roman wall was cause for excitement. To make it even better, there was even sherds of interesting typologies to be found, such as Eastern Sigilata A and black-figure attic ware. 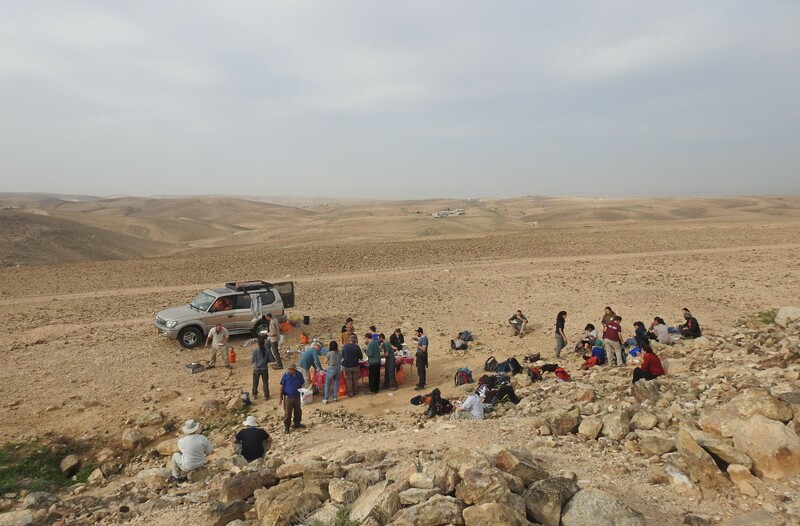 Working hard on the wall justified a quick trip to the other area under excavation when dig co-director Prof Assaf Yasur-Landau came by with a small group of dig members. 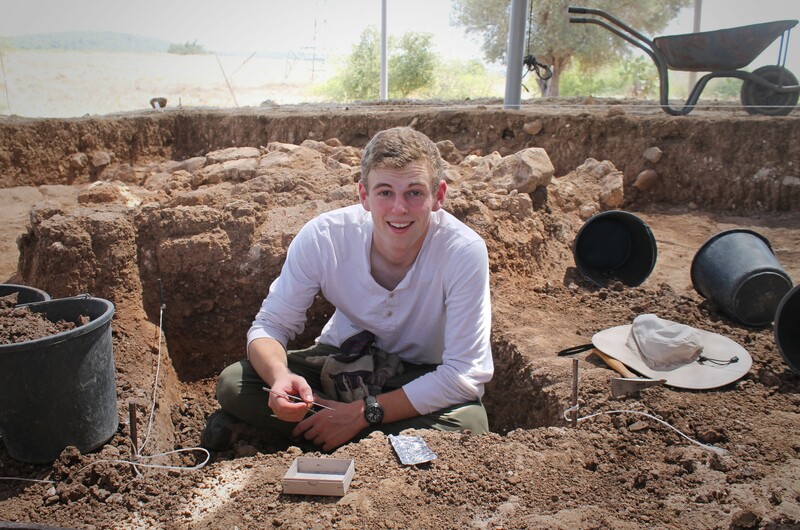 I had met Assaf at Tel Kabri the previous year, but this year he was heading up the underwater excavations at Tel Dor – a truly exciting-sounding endeavour. We caught up with him just as he was leading his dive crew on a tour of the excavation just a couple metres to the west of us. 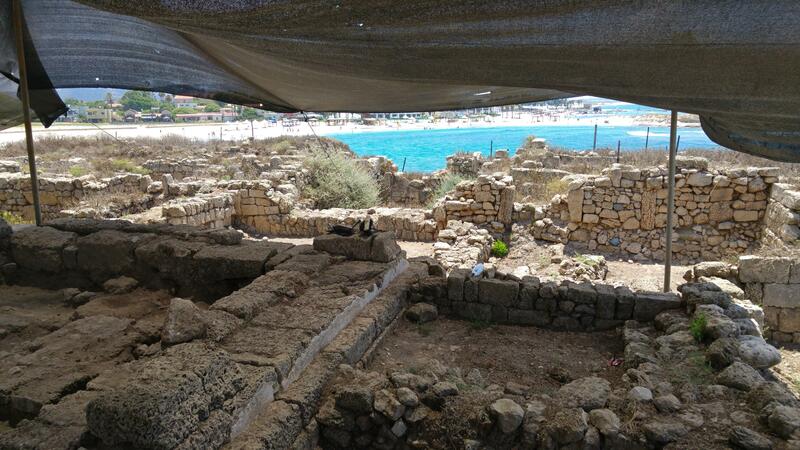 This was the site of the Crusader fortress Merle, whose meagre remains had never been fully excavated. 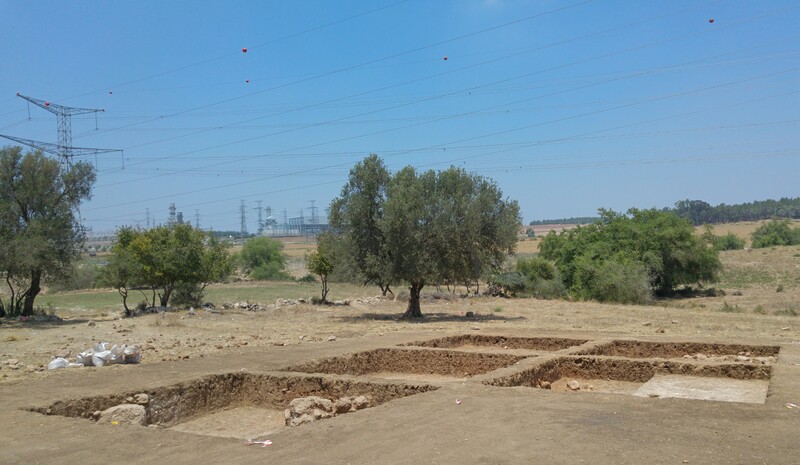 Due to my interest in Crusader archaeology, it was quick fascinating to see the excavated progress made on the ancient fortress – something I look forward to seeing in its published form. 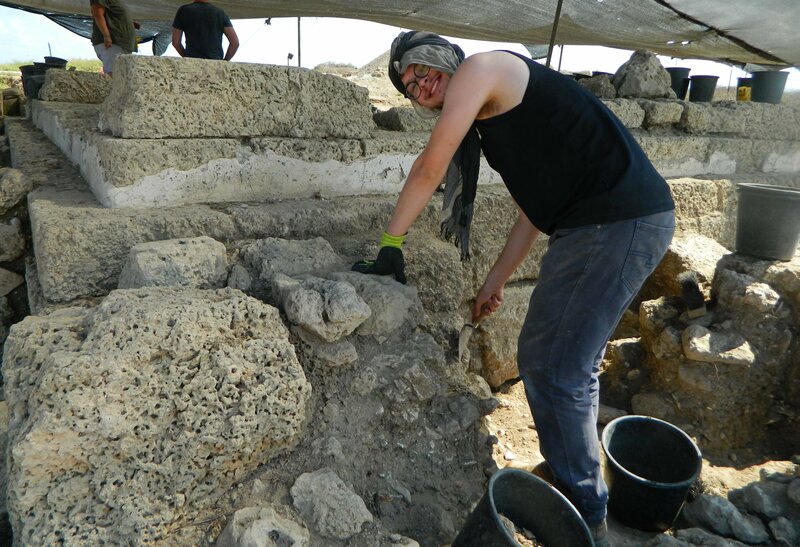 Rejuvenated from our little informative break with Prof Yasur-Landau, we returned to our south-facing wall and continued to work on the Roman stones. For those excited by the natural world, we found several murex shells, used for thousands of years to produce the finest dyes. To this day there are researchers (including Prof Zohar Amar of BIU) who seek to unlock all the secrets of this ancient dye methodology, and a room dedicated to it in the aforementioned Mizgaga Museum. 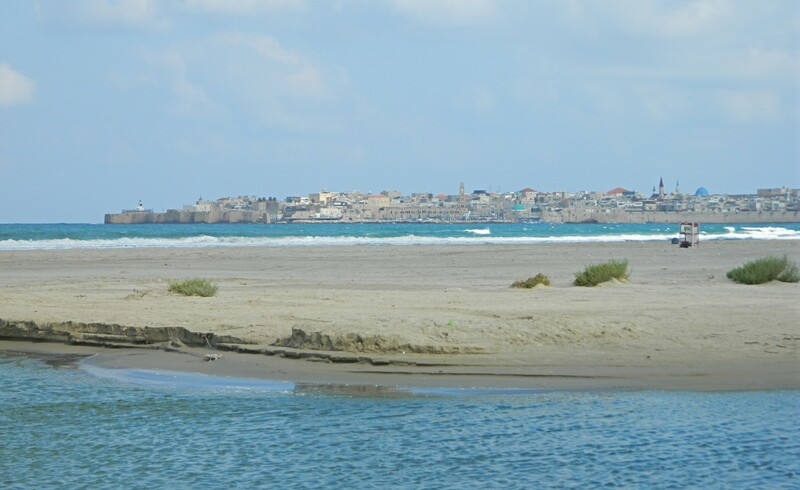 Dor was one of the principal sites for this dye production, especially during the years of Phoenician rule (Dor was their southernmost city). Unfortunately, none of the murex shells that we found we intact enough to warrant preservation, but they were still exciting to find. Just after noon, when we were coming down on the stubborn lower levels of stones in the wall, we were told that it was time to quit. There were scores of dirt buckets to be emptied and loads of tools to be stowed away. It was sad not being able to finish clearing the Roman wall, but it was getting quite hot out with the midday sun beaming down upon us. We collectively emptied the buckets, stowed the tools and parted ways. My brother was leaving with the rest of the crew, so Rebecca and I took off on our own and walked the scenic way to the museum. 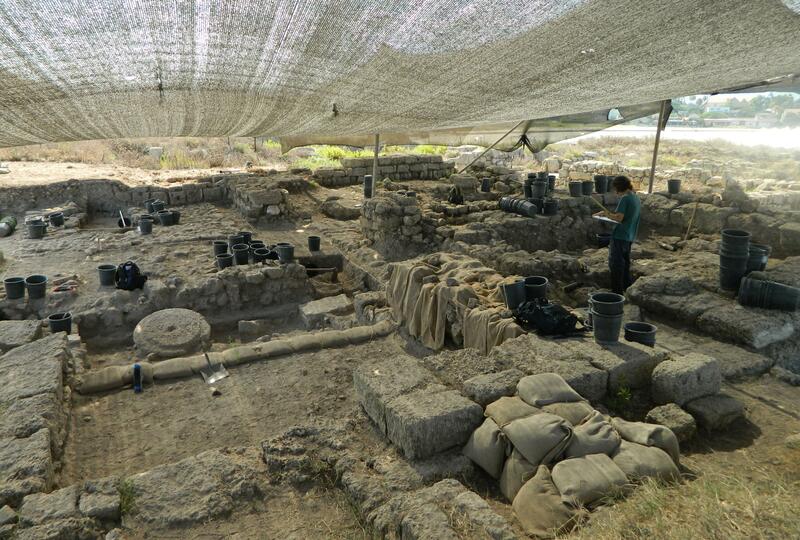 For more information on the Tel Dor Archaeological Dig, check out their site HERE. 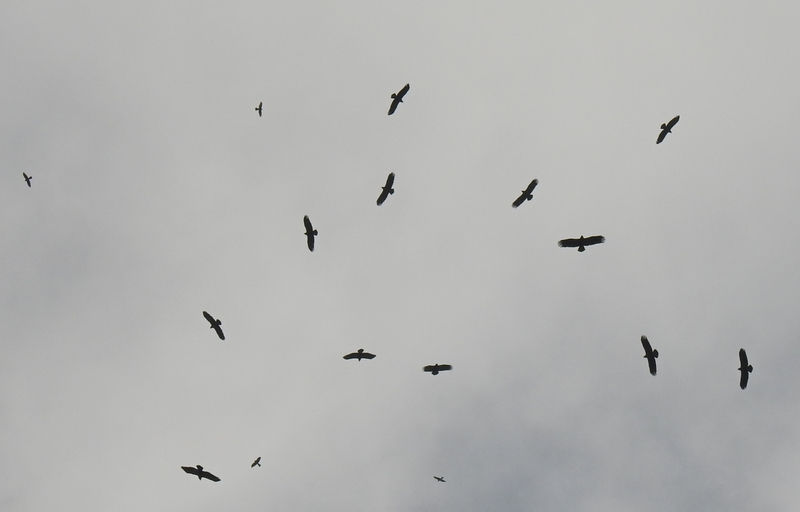 Returning to the subject of the month-long raptor migration, there was still much more for us to see. 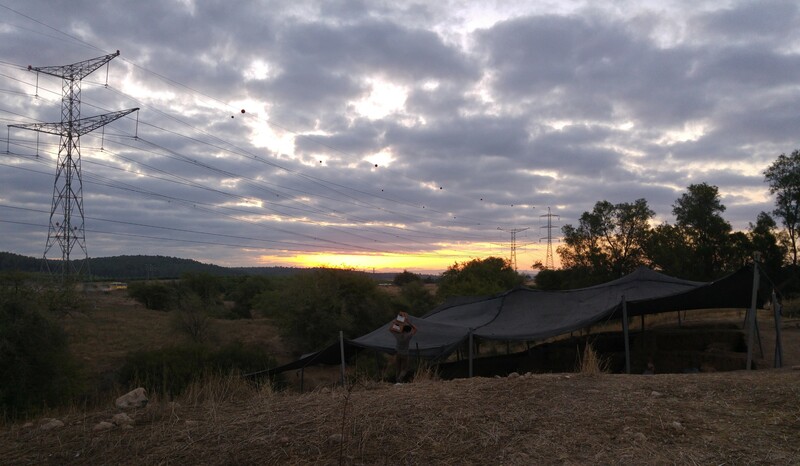 About a week or so after my trip to the Hula Valley, I was back in Givat Shmuel working on a paper when I started seeing reports of thousands of raptors flying just a few kilometres away, over the neighbouring city of Petach Tikva. I made a snap decision to go pursue the migration, and with the help of some nearby birders, decided that I’d catch what I could at Qasem Junction, a few kilometres further east. The reason there were so many eagles was due to a few days of bad weather in Turkey, which caused a delay in the migration and the birds gathered up waiting for the weather to clear. Once that happened, tens of thousands of raptors started making their way south, creating in birding terms what is known as a “Big Day”. Travelling by bus, and exercising great patience as we slowly made our way through the urban area, we at last pulled up at the Qasem Junction stop. Leaping off the bus, I immediately looked upwards and was greeted by the most incredible sight. 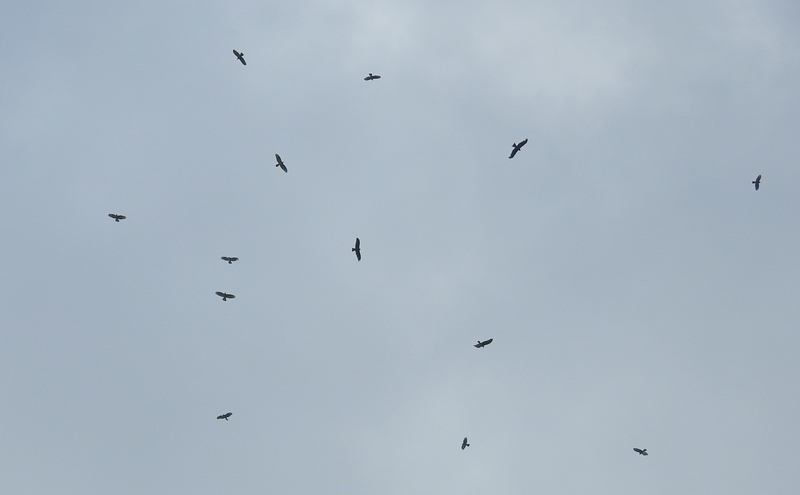 Hundreds of raptors were everywhere, no matter where I looked I could see birds flying. I ripped out my binoculars and camera and began to assess my situation. I knew that there was no way I could account for every bird passing overhead, so I began looking for birds that stood out, under the assumption that the rest were all lesser spotted eagles. 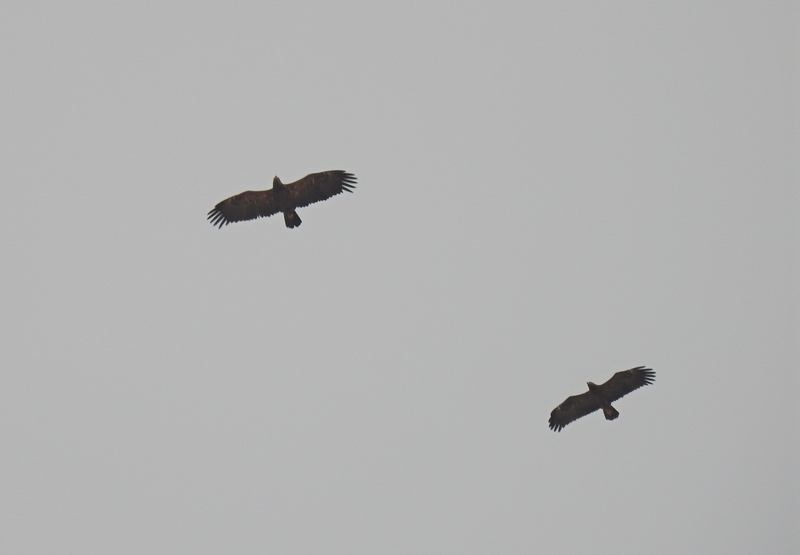 Sure enough, there were black kites, short-toed eagles and a marsh harrier mixed in with the large number of lesser spotted eagles. Within twenty minutes there was barely a bird in the sky – I had caught the last wave of the morning. However, sticking around just to be sure garnered me a valuable sighting. 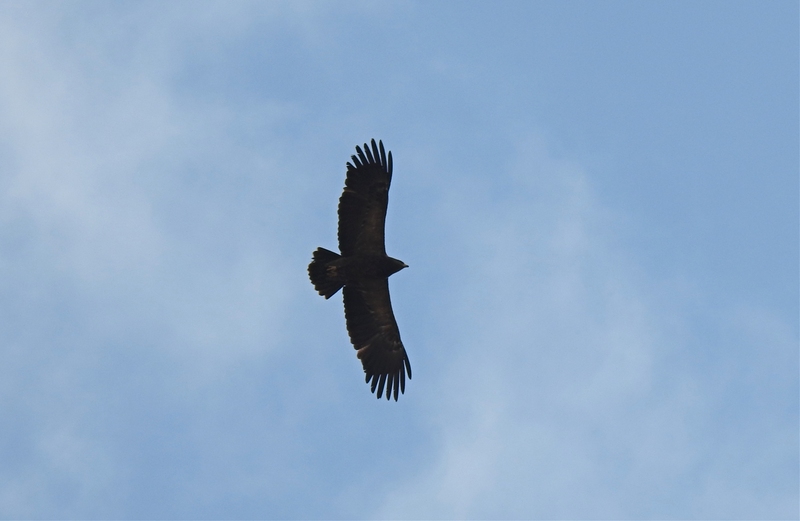 A Griffon vulture was circling far off to the east and stuck out by its large frame and square, long-fingered wings. Even a relatively large short-toed eagle was nearly invisible to the naked eye in comparison to the much larger vulture. 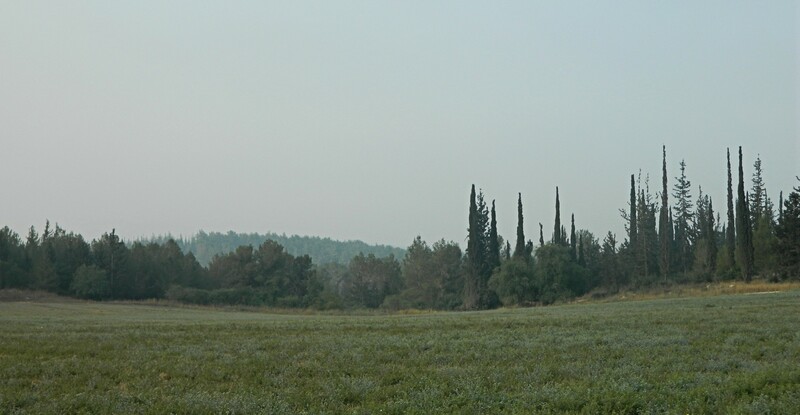 Excited by what I had succeeded in seeing on Big Day, I asked Adam if he wanted to go to Ben Shemen Forest the following morning in hopes that we’d see something similar. He agreed, of course, and we made our way to the forest in search for raptors. 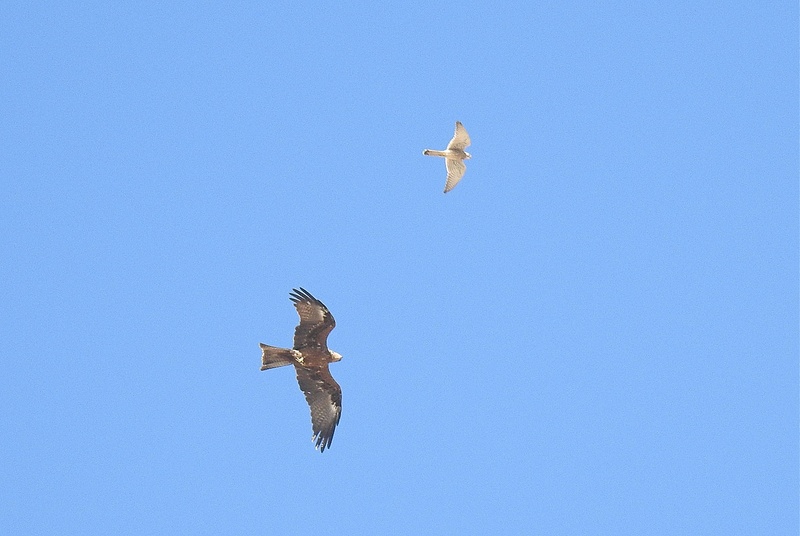 This time there was hardly any raptors, just a few lesser spotted eagles, a booted eagle and a few kites together with the aforementioned hobbies. 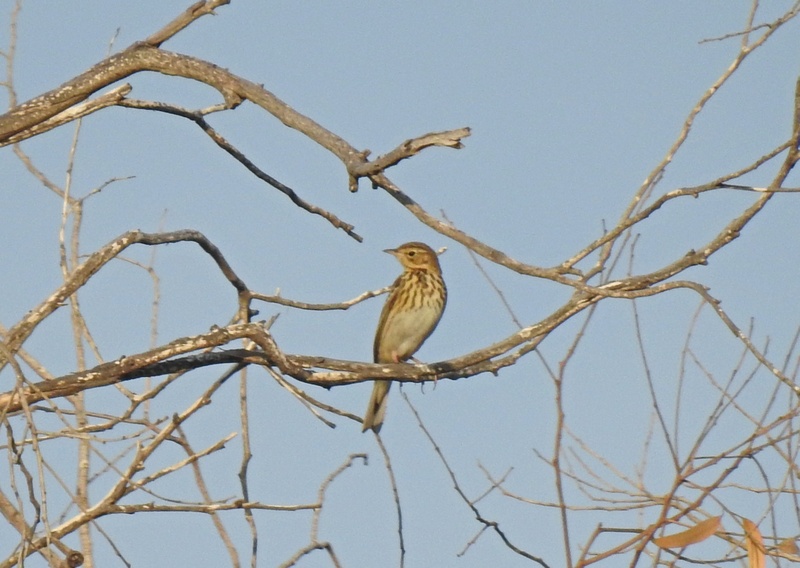 I did, however, spot my very first tree pipit perched on a tree with a nice spotted flycatcher. Feeling slightly let down by Ben Shemen Forest, we decided to explore elsewhere a few days later. Our destination was the area of Migdal Tzedek (Mirabel) just south of the aforementioned Qasem Junction. We figured that there might be interesting birding in the early morning, as well as a possibility of raptor migration closer to noon. We were so very right. The morning started off with some nice species: blue rock thrushes, great grey shrikes, red-back shrikes, redstarts, willow warblers and a few raptors as well including some common kestrels, a sparrowhawk, a black-shouldered kite and a marsh harrier. We explored the perimetre of the medieval castle and then headed down to examine the old lime kilns, keeping an eye out for wildlife. 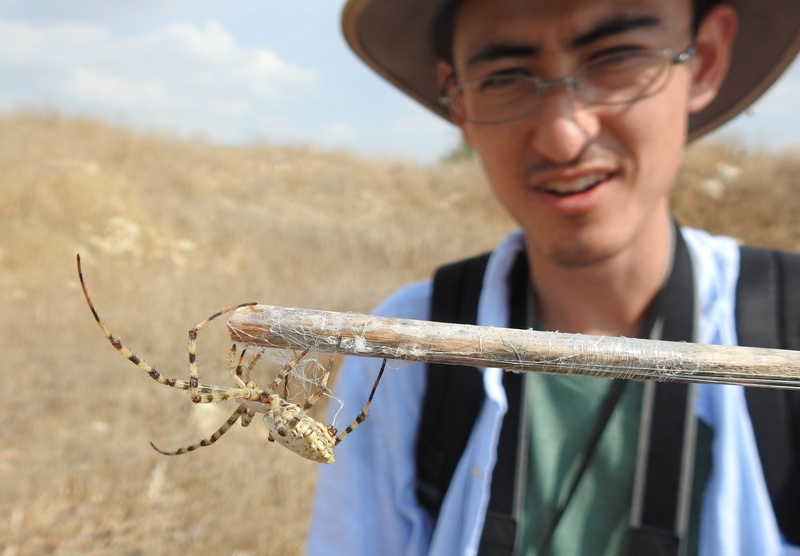 There were a few mountain gazelles, rock hyraxes and a fascinating spider called Argiope lobata. Shortly before noon Adam excitedly pointed out a few eagles flying overhead, and then the waves of raptors began with such an intensity that it was hard keeping up. 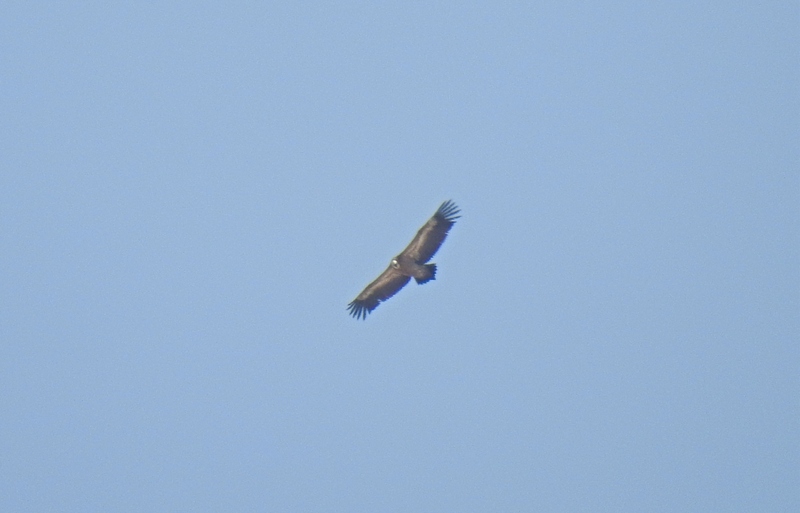 Dozens of lesser spotted eagles passed by quickly, with a few other raptor species mixed in, including: black kites, a greater spotted eagle, short-toed eagles, a long-legged buzzard and my very first steppe eagle. With that we effectively wrapped up the raptor migration season, feeling rather accomplished with what we managed mostly dependent on public transportation. Being that Israel is located on one of the world’s greatest migration paths provides never-ending fun for birders, which is one of the reasons I got into birding. Hopefully when all the raptors come back up north for the summer we’ll be able to get back out there and watch the incredible migration unfold before us. But until then, there’s always winter birding as well as a whole list of Bar Ilan University field trips just waiting to be documented. Ordinarily I prefer writing posts on individual trips, but for the past month or so there has been an ongoing migration that was the cause for many small trips, often too small to warrant a full blog post. So, in an effort to document this series of small trips that took place over the course of a month throughout the country, two summary posts will suffice. As the Eurasian summer months come to an end and the weather gets a bit cooler, hundreds of thousands of raptors begin their migration southbound. A good number of these birds of prey make their way via Turkey, Syria, Lebanon and then Israel, where many stop to spend the night. 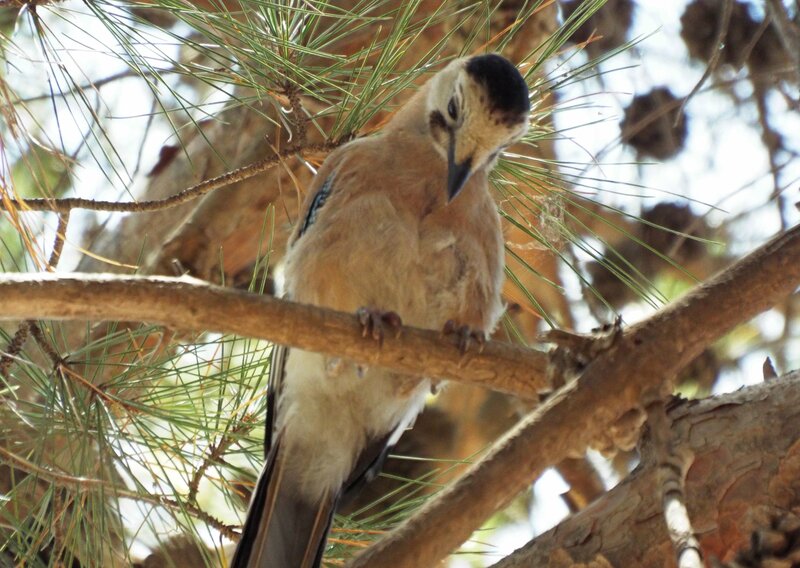 There are several “roosting zones” throughout Israel, generally wooded regions such as Biriya and Ben Shemen Forests, where these birds can be seen in the mornings as they fly back up into the hot air thermals to continue their journey to Africa, where the weather is nice and warm. 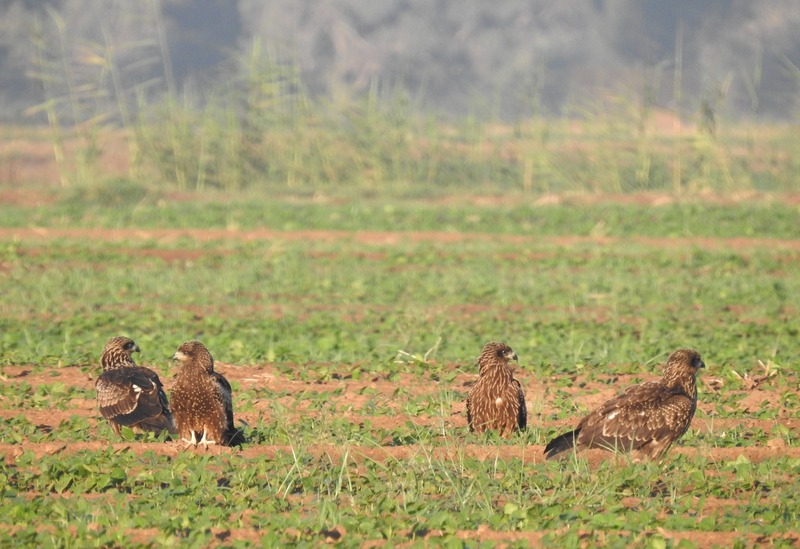 In the beginning of September the honey buzzards started appearing in Israel as they made their way south. In sync with the daily birding reports on social media, I asked my friend and fellow birder Adam Ota if he’d like to take a trip up north to watch for honey buzzards at a lookout at the Biriya Forest. This launched the raptor month, and we arrived nice and early that Sunday morning to get our birding on. Being that most migrating raptors don’t start moving till after 8am, we had time to wander around the woods looking for other forms of wildlife. 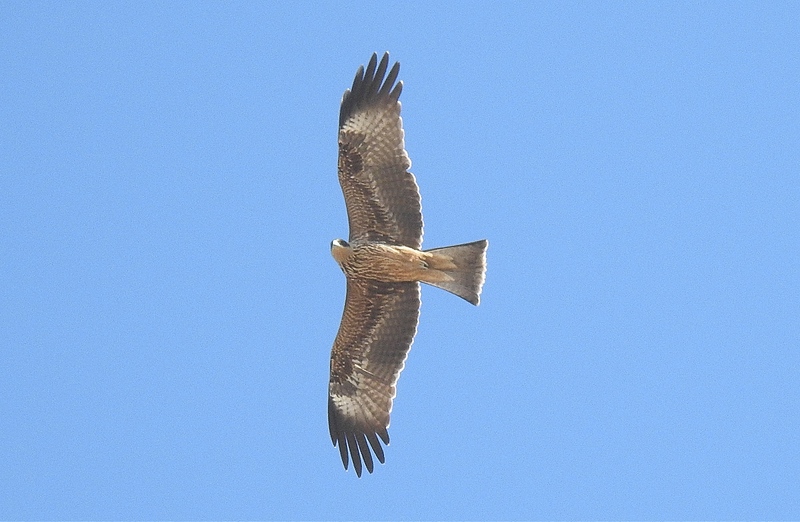 We found some classic seasonal birds, such as an Isabelline wheatear and a spotted flycatcher, as well as a handful of noisy chukars, a whole slew of freshly awoken black kites and my first hobby (type of falcon) of the year. When we got back to the lookout we found another birder, Prof Shlomi Segall of HUJI, set up and watching the valley down below. 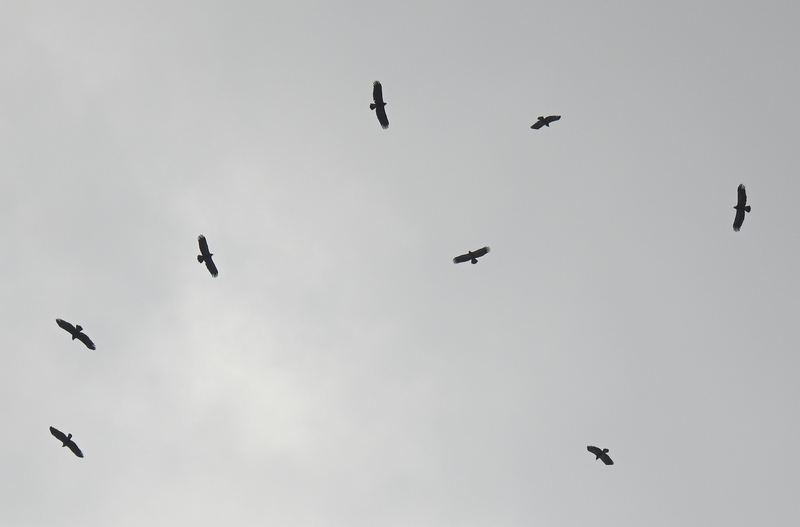 Soon enough, the honey buzzards started appearing by the tens, and some even soared by relatively close to our perch at the valley’s edge. 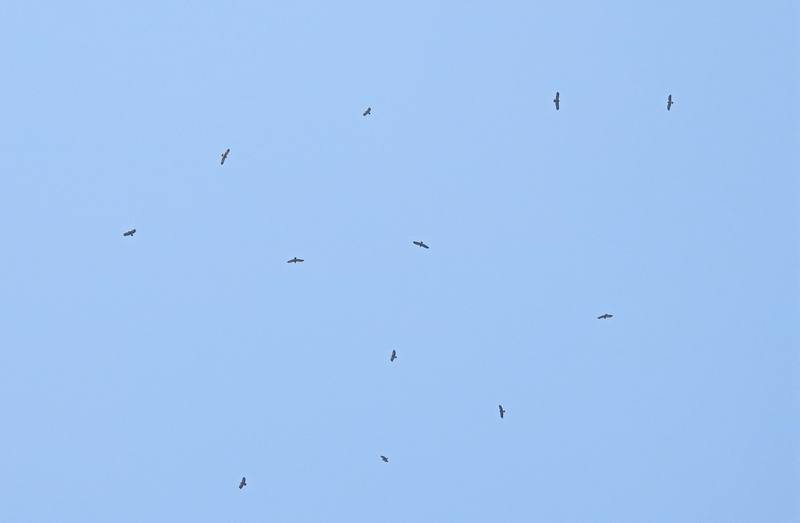 With the honey buzzards came a handful of other raptors, also migrating, including some short-toed eagles, a marsh harrier, some more black kites and our first lesser spotted eagle of the season. For a good portion of the time there was a huge, dark, low-hanging cloud that obscured the flying birds until they exited it, popping suddenly into view which made it all the more exciting. Hundreds of birds later we wrapped it up and headed to Ma’alot where we were to be spending Rosh HaShana, the Jewish New Year’s. Two weeks passed and the bulk of the honey buzzards were already getting settled in down in Africa. 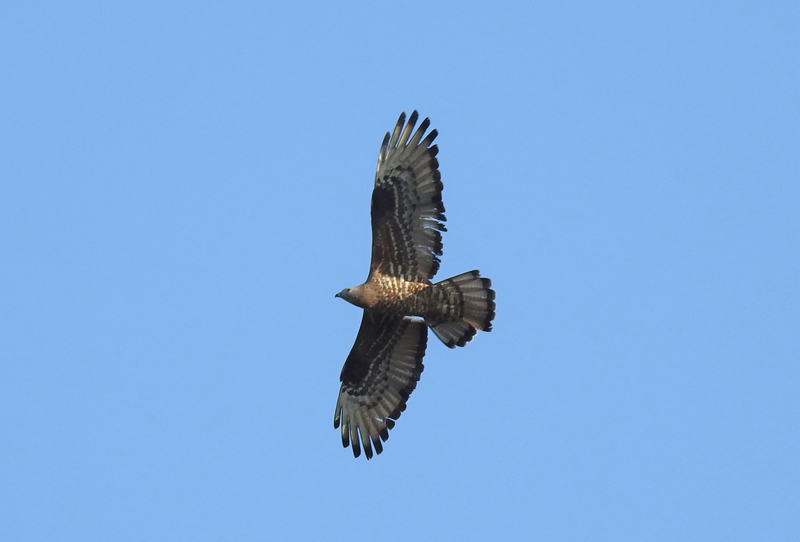 The next phase of raptor migration was just starting, and the main features were the lesser spotted eagles and the Levant sparrowhawks. 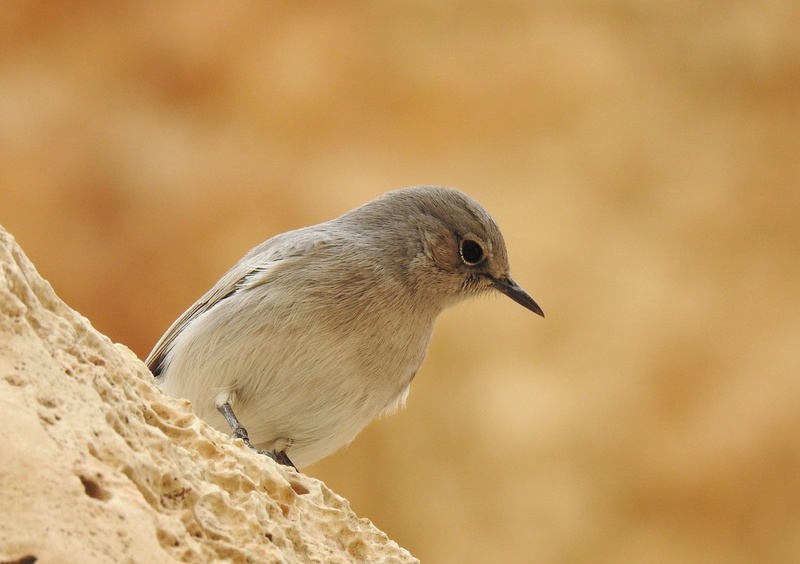 Both of these species fly predominantly through Israel, so sightings are basically guaranteed during the migration season. Perhaps the best place to spot both the eagles and the sparrowhawks is at Ben Shemen Forest, in the morning when they take to the skies for another day of flying. It was still in the beginning of their season, but Adam and I figured we’d take a shot at seeing what we could while still in the centre of the country. I had plans to spend the Sukkot holiday up north with family, and we didn’t want to miss out on the fun. We arrived early in the morning and hiked our way from the north side of the forest to the south end, where the so-called lookout is. There were a handful of birds to be seen in the forest, and even more when we finally exited it. A couple local kestrels, a few black kites, a honey buzzard, a masked shrike and a handful of songbirds made up the bulk of the sightings, but then something unique caught Adam’s eye. Perched on a tree some ways away was a bird that looks suspiciously like a peregrine falcon (a bird that has still eluded us to this day), but upon closer inspection turned out to be a hobby. It certainly was very exciting getting to watch this beautiful bird from relatively close, and it was had to continue on to the lookout where the eagles were to be found. We were not going to be disappointed, for immediately when we arrived at the lookout area we saw eagles coming out out of the trees. They swirled in large circles as the soared upwards, catching the morning’s warm air. Tens of lesser spotted eagles and Levant sparrowhawks were slowly making their way past us, and we had to keep our eyes peeled to find other raptor species in the group. 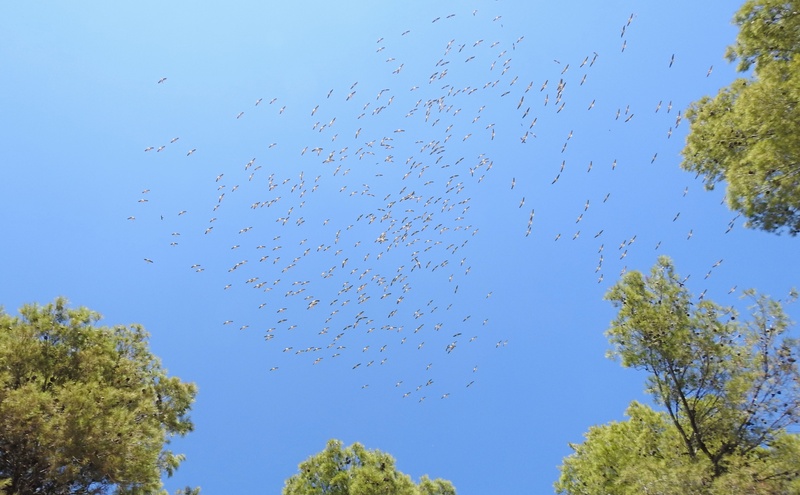 Short-toed eagles, booted eagles, black kites and honey buzzards joined the spectacular aerial display above us, dozens of large birds filling the skies. This was my first time seeing Levant sparrowhawks in migratory flight and it was quite interesting to see them in contrast to the much larger eagles. 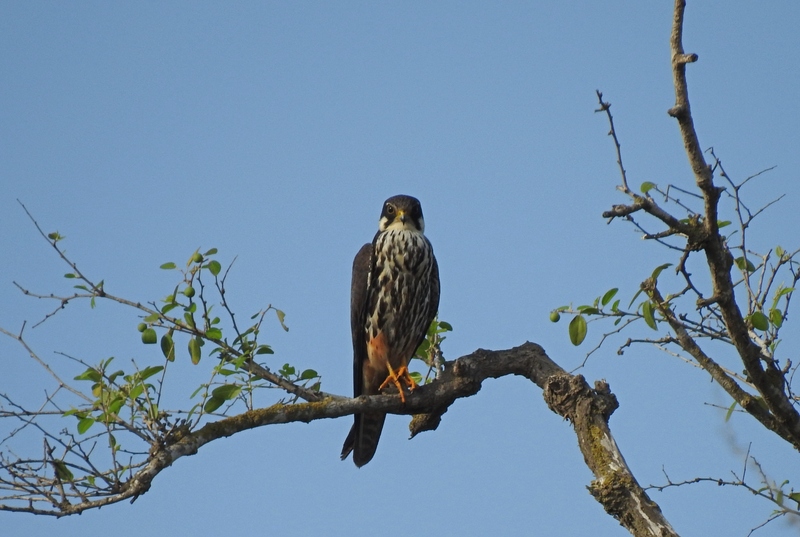 Temporarily satisfied with our migration sightings, I didn’t get back out again for a few days until I was contacted by Shlomi, who we had met watching honey buzzards at Biriya Forest. 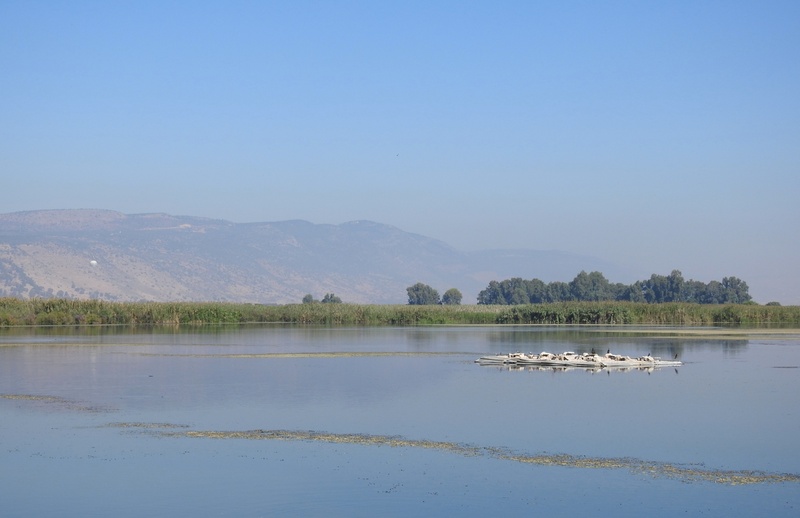 I had posted online about seeing some raptor migration (honey buzzards, eagles, black kites and more) over my sister’s place in Ma’alot, and since we were both in the area we took an early morning trip to the Hula Valley a few days later. 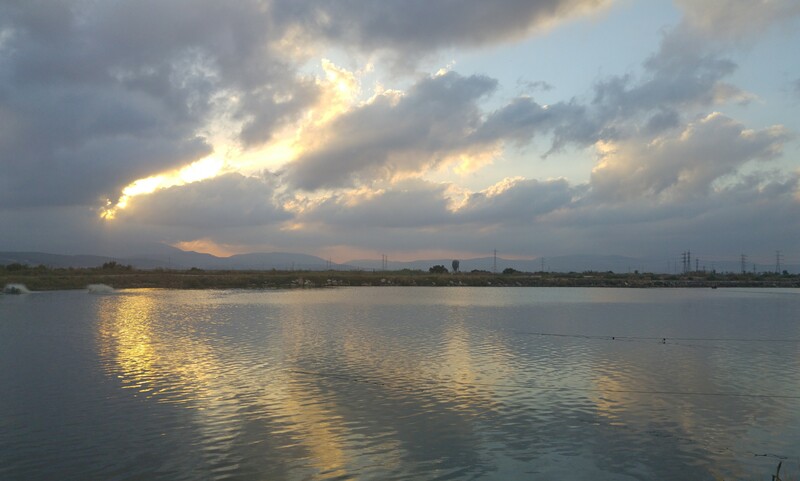 We arrived at the Hula Valley at first light and began our birding by driving alongside the fields. I had never really done “car birding” so it was very illuminating to see how the birds allowed us to get much closer than anticipated, as well as coming close to us on their own accord. As we drove the fields we spotted a large number of bird species, including: yellow wagtails, wheatears, whinchats, rollers, lesser grey shrikes, black kites, black shouldered kites, white storks and a male black francolin. 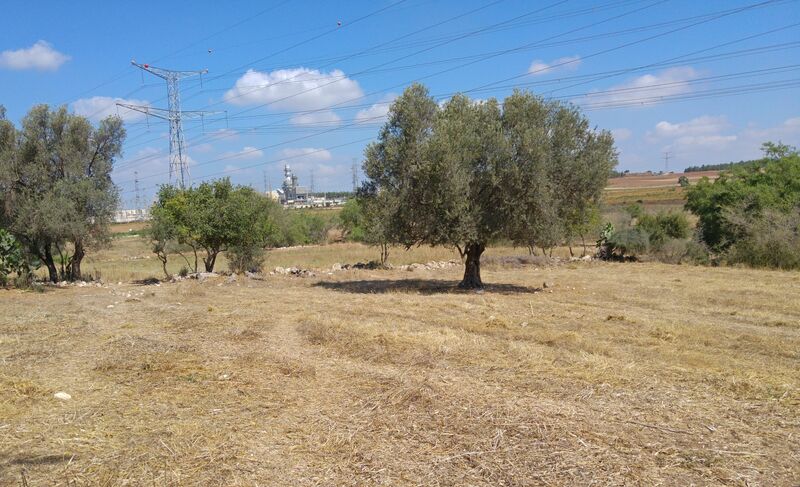 We then reached a particular stretch of fields which Shlomi referred to as a place to find raptors. Sure enough, there was a lesser spotted eagle hunting grasshoppers or locusts on the ground, a long-legged buzzard perched far away on a bale of hay and a few marsh harriers hunting at the edges of the fields. 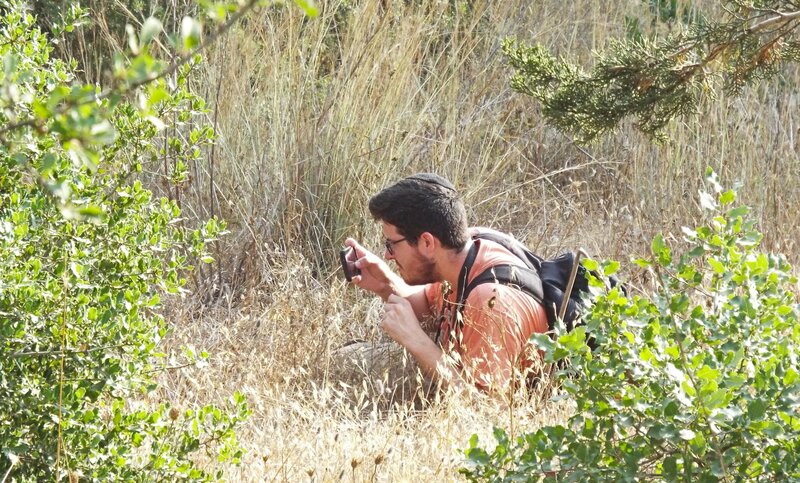 Shlomi had a particular reason why he wanted to come to the Hula Valley, and that was to spot the rare pink-backed pelican that wandered into Israel. There have been less than a score of pink-backed pelican sightings in Israel and to have one just waiting for us to spot in was a great reason to wake up early. We entered the Hula Valley National Park and began a quick tour of the place, stopping at the usual places to see what we can see. There were a fair number of waterbirds and waders, including: mallards, pin-tailed ducks, ruffs, common snipes, a marsh sandpiper, pygmy cormorants and a pallid harrier. At last we reached the lake and started searching for the pink-backed pelican. We found him relaxing with a handful of great white pelicans, which are much larger and coloured slightly differently. There was great elation in finding the rare bird and the following birding on the way out of the park only brought up a few species we hadn’t yet seen that day, just a few thousand pelicans in the skies excited us by their sheer numbers alone. The other week I had an urge to go out and explore some of the local sand dunes before the summer ends. With the onset of the colder weather, and the accompanying rain, on the horizon, opportunity beckoned to comb the great dunes in search of insects, arachnids and reptiles. 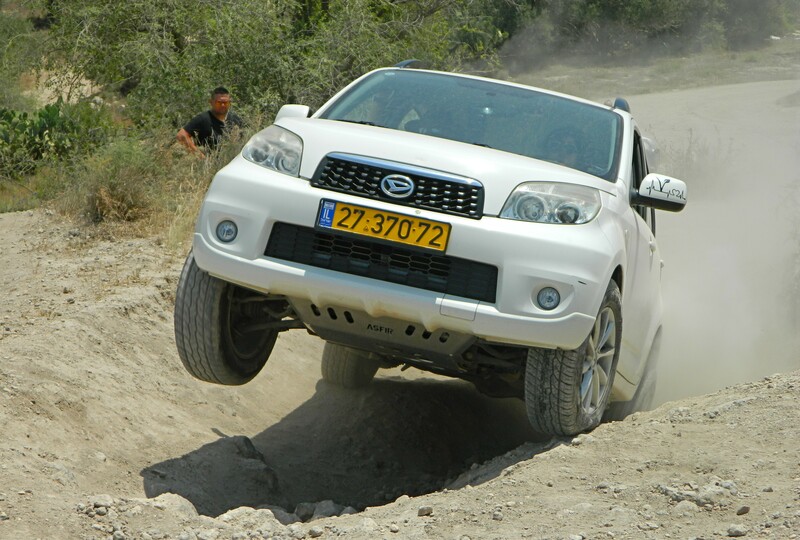 The dunes just south of Holon were recommended to me, and I reached out to my travel buddy Adam Ota to see if he wanted to come along. We equipped ourselves with cameras and flashlights (and a stick wielded by Adam) and set out for the bus as the sun began to set. We arrived at the edge of Holon and made our way through a park and past a stadium, gearing up before we stepped out into the sandy dunes. Overgrown with small bushes and other sand-loving plants, we found many trails crisscrossing the dunes and chose those that took us further and further south away from civilisation. I had just been gifted a new camera from my parents – a Nikon P900 with an astounding 83x optical zoom – and, as such, was rather excited to test out its night-time capabilities. As we crested the first dune we startled a stone curlew, which flew off with calls of alarms, leaving us in silence. There was no moon to be seen, yet Mars and a few stars twinkled in the sky above us. Planes from the nearby Ben Gurion Airport passed overhead from time to time and our flashlight beamed danced illuminatingly in the relative darkness. 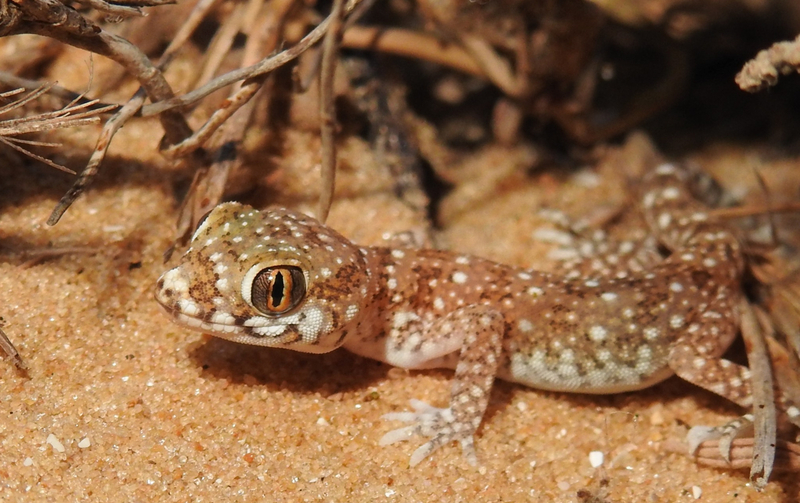 The first interesting find of the evening was a small elegant gecko, which ran swiftly to cover once being exposed. A brief stop at a bush some minutes later revealed a praying mantis egg case glued to a stick. Moments later we made an even more exciting discovery: a baby chameleon was asleep nearby, clutching on to a twig as he snoozed. We snuck up to it, eager to take pictures, and then noticed that there were even more baby chameleons nearby. 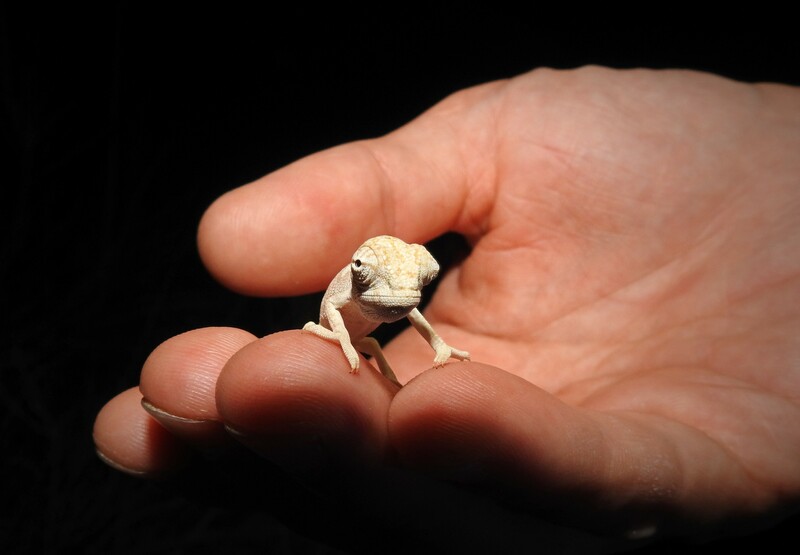 We enjoyed the company of the baby chameleons, and then pushed on further to find more interesting wildlife. Personally, I had my eyes out for a snake, any snake but preferably either a viper or a sand boa, both of which dwell in the dunes. Instead we found more chameleons, giant beetles, ants, antlions, dragonflies and grasshoppers, all going through their nightly routines as we passed through their simple lives. Another elegant gecko was spotted by Adam, hiding underneath a sheet of wood that we lifted up in search for critters. 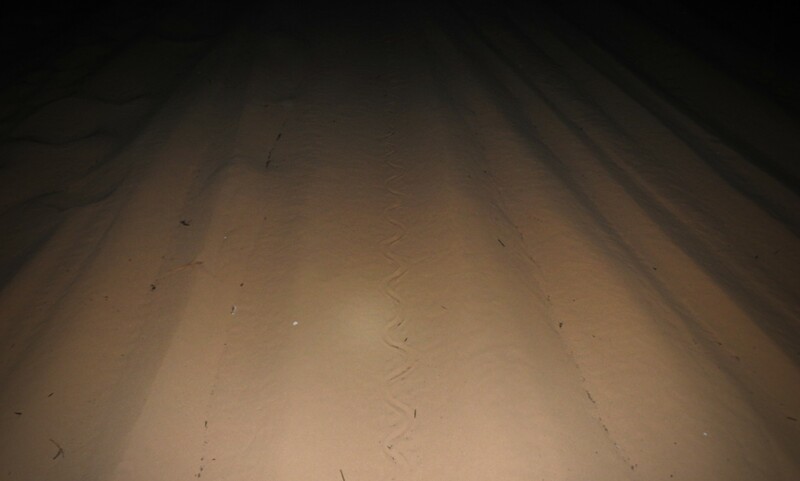 Next, we found the tracks of a medium-sized snake that had made its way up/down the sandy slope of a dune. Searching for the ends of the tracks produced no results, but it was shortly thereafter that we found another cool find. 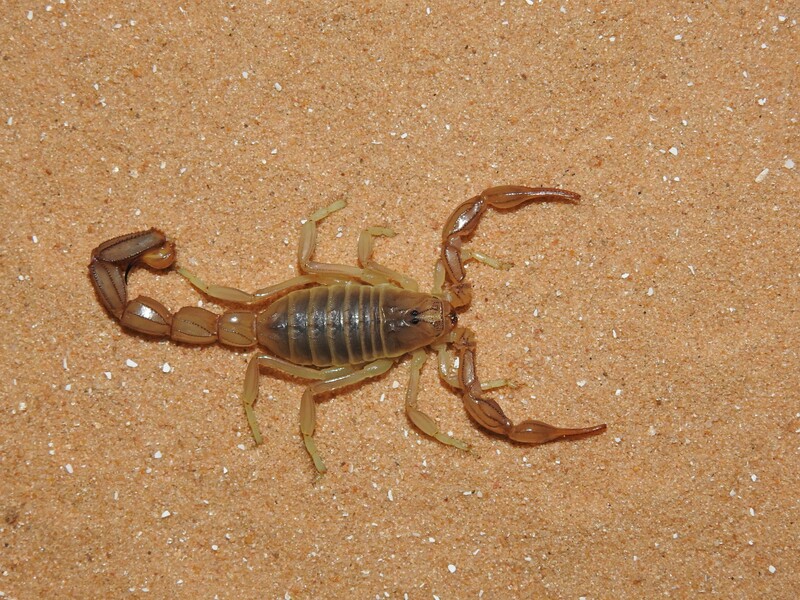 Noticing a slot-like hole in a sandy slope, we peered inside to see an African fattail scorpion waiting in ambush. Actually a pretty dangerous scorpion, we had quite the time finding more of them in the sands, and taking their pictures proved to be most exciting. Taking note of the time, we decided to head back to Holon to catch a bus back to Givat Shmuel before it was too late. 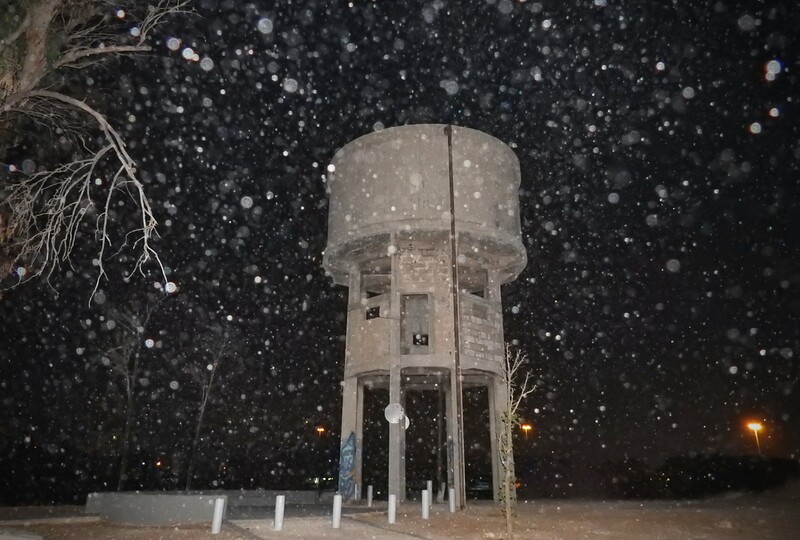 On the way, we crossed the old “Security Road”, which was paved in 1948, and visited the old water tower built in 1936 to service the local Jewish population. 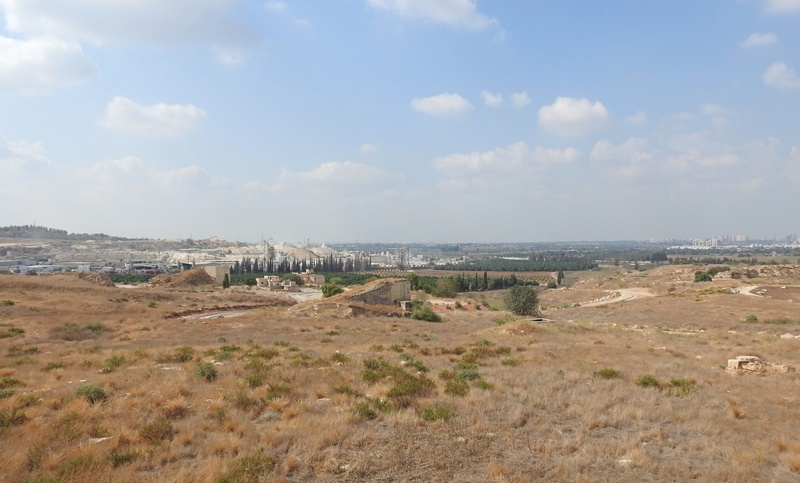 We made it back to Givat Shmuel happy with what we succeeded in seeing, yet I still had a nagging feeling to go back to find a snake – any snake at this point. A few nights later I reached out to Adam and we set out once again in search of exciting dune lifeforms. We decided to comb a different area, starting just west of where we ended the time before, and began to search. 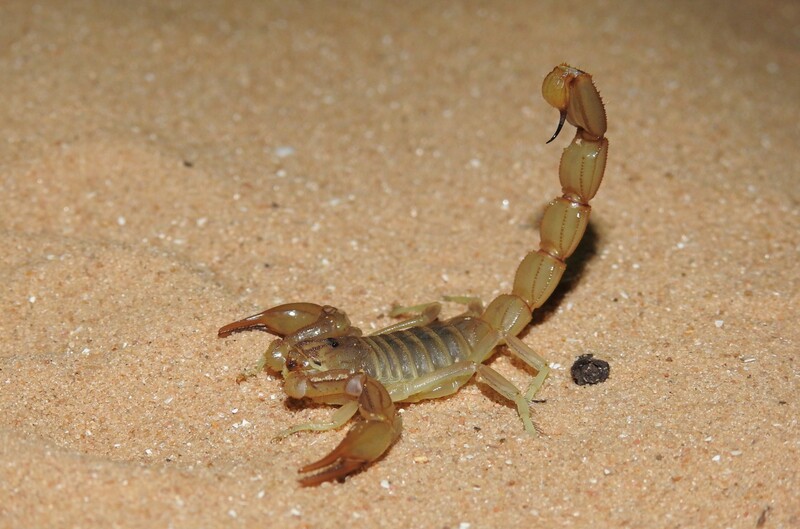 This time we found dozens of fattail scorpions, the tracks of many wedge-snouted skinks and those of a gerbil as well. A few more of the same sightings as last time, minus the baby chameleons, and we had seen all that there was to see. No matter how hard we tried we were unable to locate a snake, but there is still a whole lot more of the dunes to explore so hopefully next time we’ll be met with success. Until then we have many ripe days of birding before university starts up again, the fall migration kicking off to a lively start with thousands of shrikes, wheatears, eagles, honey buzzards, warblers and more just waiting to be seen and documented. Just few weeks ago I took a short morning trip to Nachal Na’aman, a short stream in the Western Galilee. 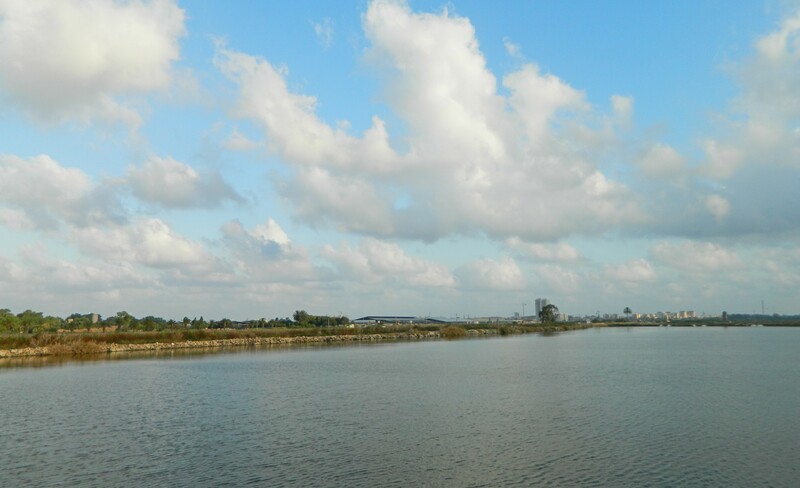 I had received word that there was good birding to be had at the fish ponds of Ein HaMifratz, which are to be found on the banks of the stream. 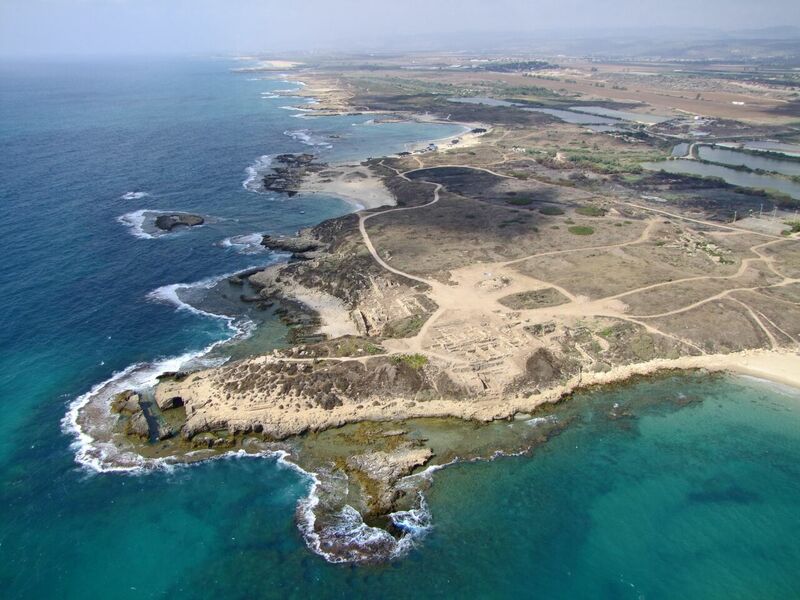 In addition, the mouth of Nachal Na’aman, which opens into the Mediterranean Sea, is a good bet for shorebirds and other feathered friends. With this in mind I set out alone from Ma’alot in the early morning and drove for half an hour or so until I reached the kibbutz of Ein HaMifratz. 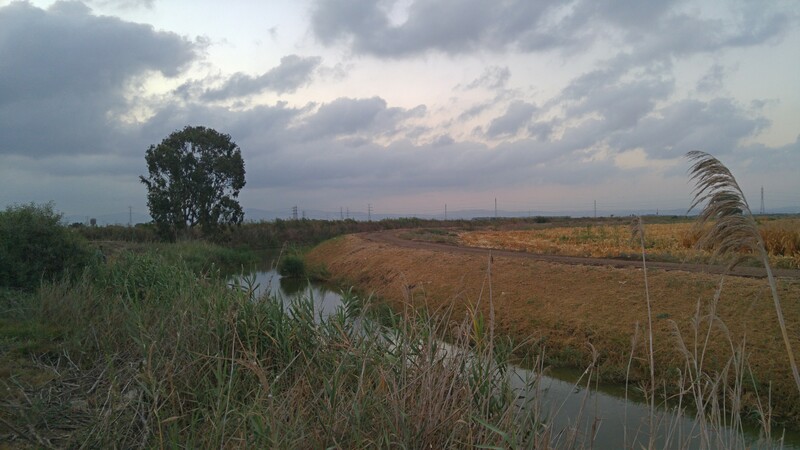 I drove through the kibbutz, passing some odorous cowsheds, until I reached the fish ponds. I parked and got out to explore, the morning light still not strong enough for my camera to operate properly but enough to start looking for interesting wildlife. From the very start I could see and hear a handful of species, mostly those that were expected to be there and therefore aren’t that exciting to spot. 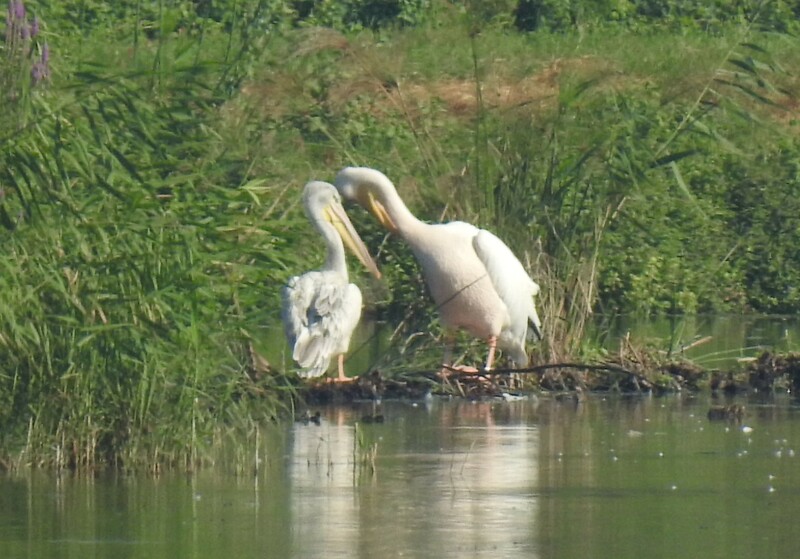 These are, of course, the several heron and egret species that can be found throughout the country. It was nice, however, to see all three species of kingfishers (common, white-breasted and pied) as well as a juvenile goldfinch flying amongst the thorny thistle that grows beside the ponds. Schematically speaking, the fish ponds are rectangular bodies of murky water that contain an unknown number of fish that are fed by mechanical arms protruding over the water. Due to the high fish-to-water ratio, many species of fish-eating animals come to hunt at the ponds, and, as a result of that, birders and nature photographers come to watch. 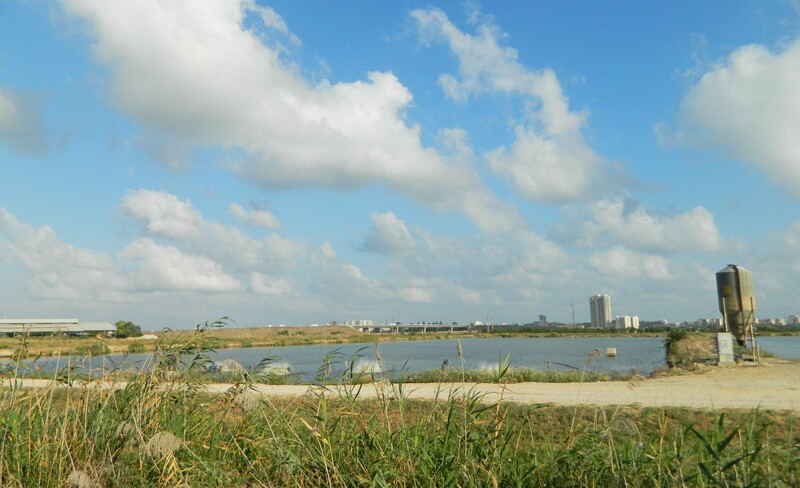 I began with a short walk alongside the northern bank of Nachal Na’aman, hoping to see something interesting but it was actually in the fish ponds where I found the first interesting sighting of the day. I had noticed something moving at the water’s edge, and realised that it was an African softshell turtle, the famous inhabitants of Nachal Alexander. While it’s true that they aren’t exclusive to Nachal Alexander, it’s not too common to see them in other bodies of water. 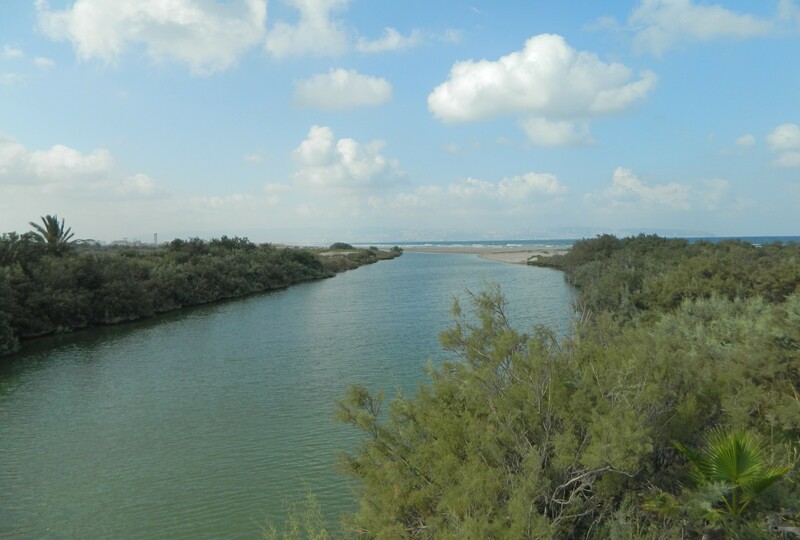 I crossed over the concrete bridge that spans Nachal Na’aman, taking note of the small blue plaque that informs visitors on the role the bridge played in the military push to conquer the Western Galilee in the War for Independence. From the bridge I began to circle one of the fish ponds parallel to the stream, taking photographs of the common terns that shrieked by in flight. A handful of gulls, mostly Armenian and yellow-legged, made appearances but it was mainly the terns that captivated my attention. The gorgeous sunrise, with the beams of light piercing through the thick, dark clouds made a glorious scene, especially with the birds everywhere. As I walked I would incidentally flush out night herons that were standing at the water’s edge waiting for prey to appear. On the other side of the pond I noticed a common sandpiper feeding as well as a few river crabs that scuttled into the water as soon as I got too close. However, it was a slight movement on the opposite bank that excited me most. 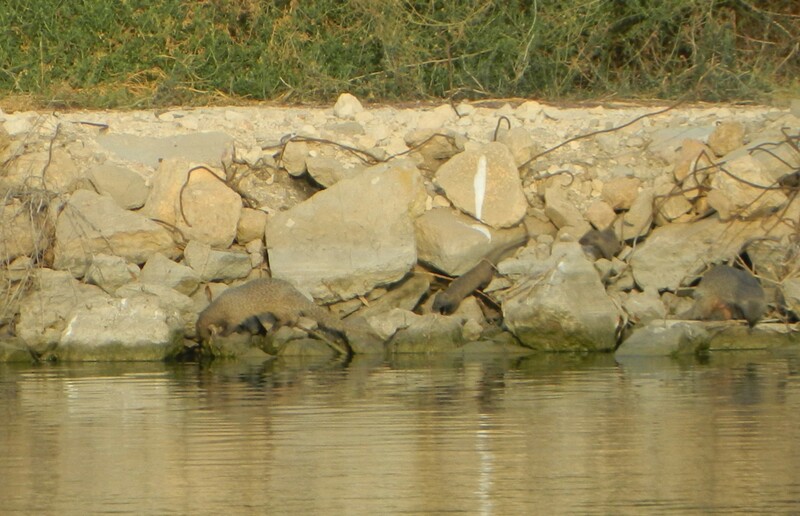 A small group of Egyptian mongooses (two adults and two juveniles) were patrolling the pond’s perimetre, likely looking for some tasty breakfast to feed on. In this manner I explored several more of the fish ponds, taking note of some more fun birds such as hoopoes, mallards and others. I even watched an interesting scene play out: an adult common tern came flying over from another pond and made a noisy entrance to a group of terns sitting on a line. With the aid of my zoom lens I was able to see that the adult had a small fish in its mouth and landed beside a juvenile who begged for the tasty morsel. I got distracted shortly thereafter and missed the conclusion of the scene, but there’s a good chance that the juvenile received a delicious meal. 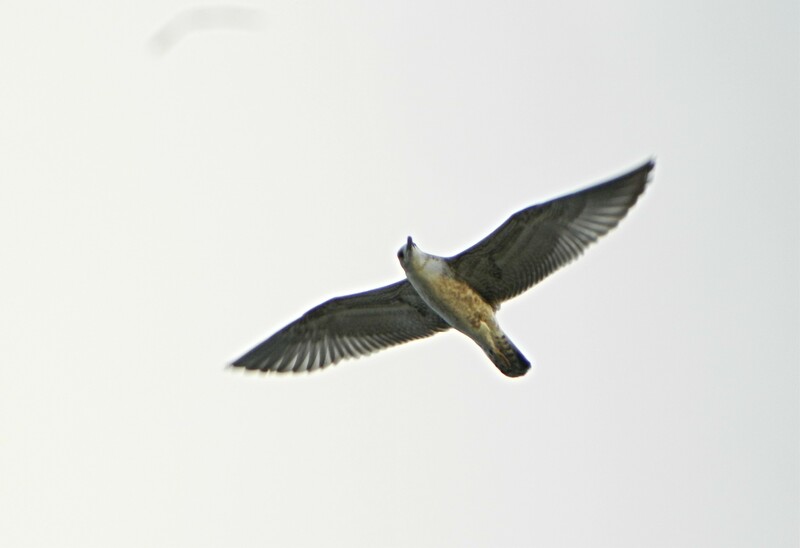 When I had walked quite a ways I noticed a bird of prey soaring high up above – a black-shouldered kite. Then, a gunshot rang out and I felt a feeling of confusion. Minutes later I realised that the fish pond people drive around and fire shotguns into the air to scare off fish-eating birds. I’m sure they were shooting blanks, but the scene was reminiscent of a western film with the clouds of smoke rising into the air following the warning shots. 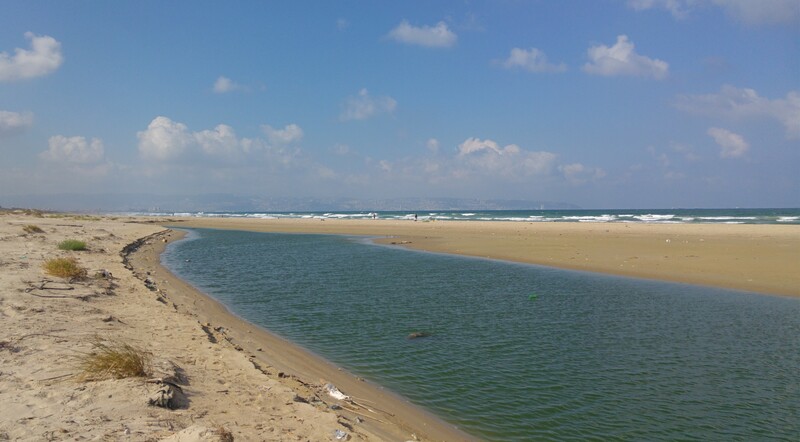 At last I had had my fill of the fish ponds and decided to go visit the mouth of Nachal Na’aman next. It was a short drive and I found a place to park my car not far from the stream. 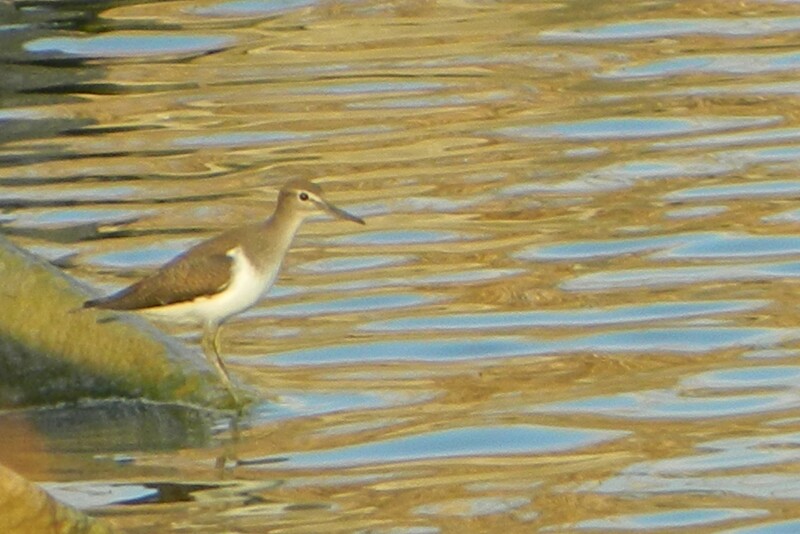 I waved to a fisherman as I began to walk a streamside path, noticing another common sandpiper feeding at the water’s edge. I reached a small bridge and saw the Mediterranean Sea before me, and my anticipation rose. Trudging through the overgrown dune-like terrain, I quickly made my way to the sandy area between the stream and sea where I saw terns congregating. Suddenly a tiny movement caught my eye – my very first greater sand plover, and then another – a ruddy turnstone in gorgeous summer plumage. I was excited and for good reason: the weather was beautiful, the sea beckoned and there were new species to find. The terns were more of the common terns that I had seen at the fish ponds, but a small flock of sanderlings landed nearby and began strutting about looking for food. I reached the end of a long pool of backwater, where the waters of the stream and sea combine, and began to circle around along the seashore. With a view of the Old City of Akko in front of me in the distance I walked, alternating between taking pictures of the view and taking pictures of birds. I had seen this view before, in a video taken by wildlife expert Amir Balaban (as can be seen HERE), and I felt inspired. 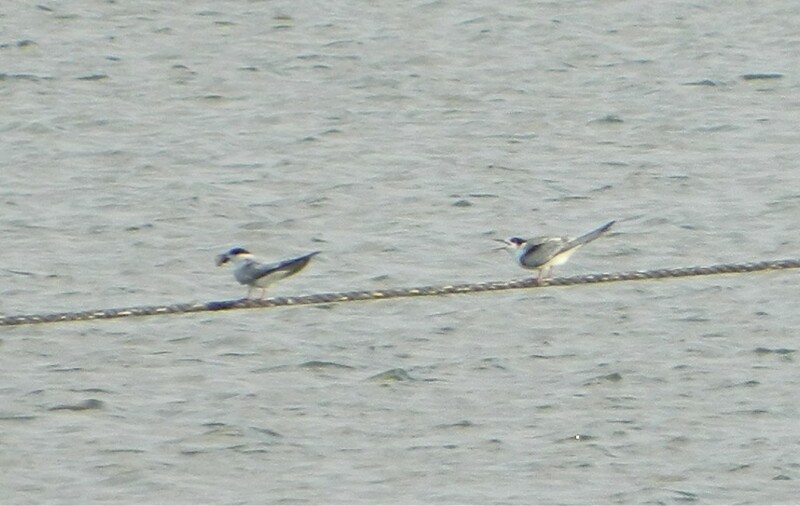 In quick succession, I had sightings of Kentish and common ringed plovers, also new species for me. 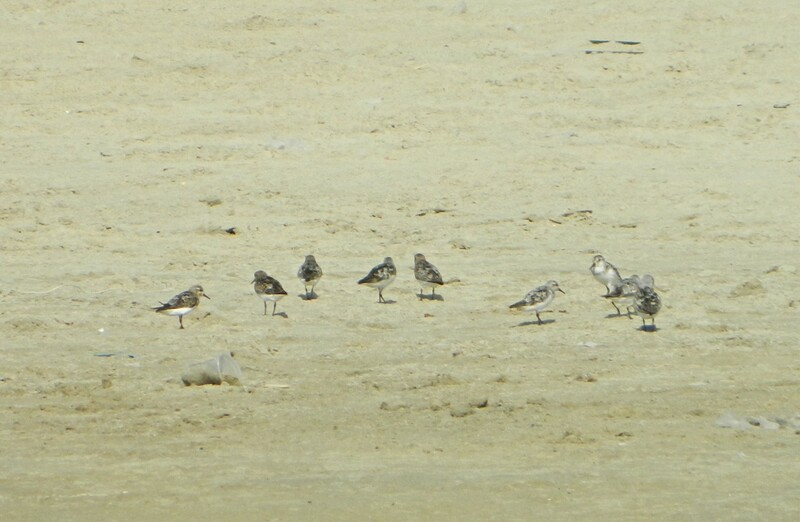 It was rather exciting walking down the beach and seeing shorebirds everywhere, rummaging around like common pigeons or seagulls. At last I reached the end of the dry sand, where the stream’s waters officially meet the sea, and made a decision. 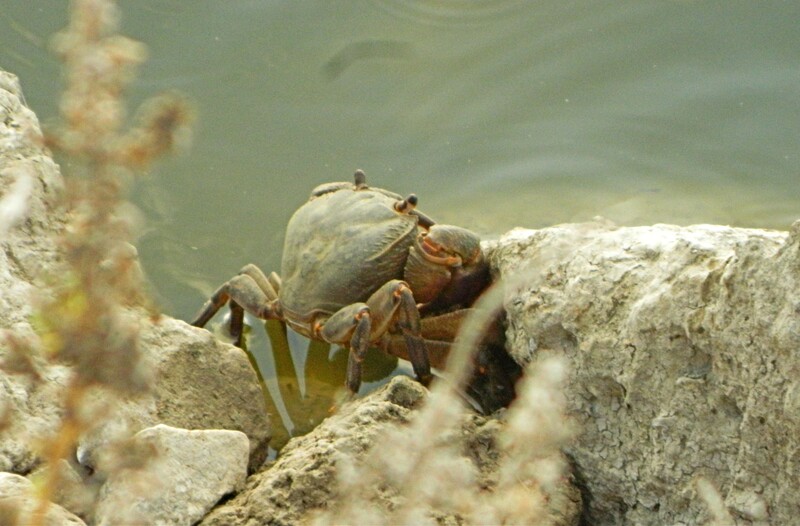 Rolling my pants up and taking my shoes in my hands, I forded the shallow water, spying a yellow crab racing across the sandy floor in a similar manner. But as I lollygagged, enjoying the cool water on my legs, I was caught by some minor waves and decided it’d be better to not get completely soaked. My final act was to walk a bit further along the beach and then cut across the so-called dunes back to the parked car. Fortunately, a few ruddy turnstones were foraging and seemed unthreatened by my presence. When one got relatively close I decided that I wanted a better shot of this handsome fellow and laid down on my stomach to get a better angle. 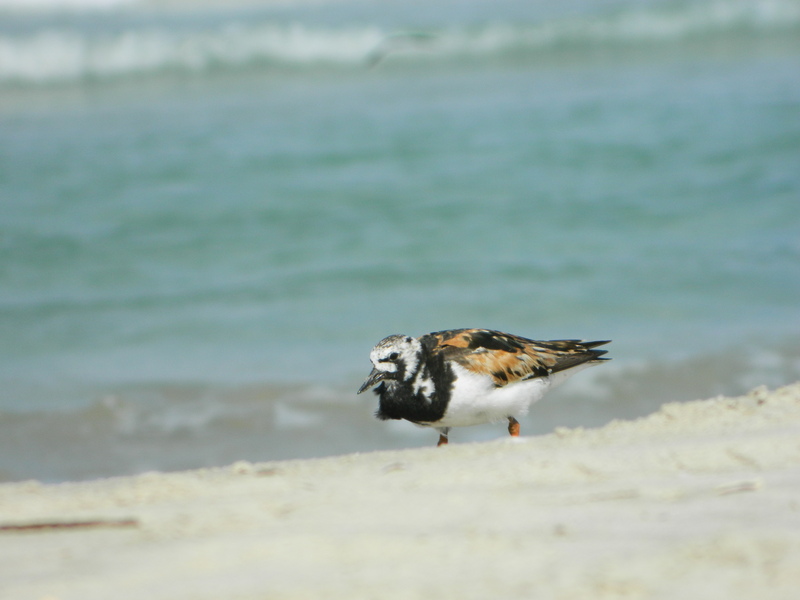 The turnstone only let me get one good photo before running past me and with that I decided to call it a day. It was a lovely little trip with four all-time new species for me, making me think about more upcoming birding adventures. 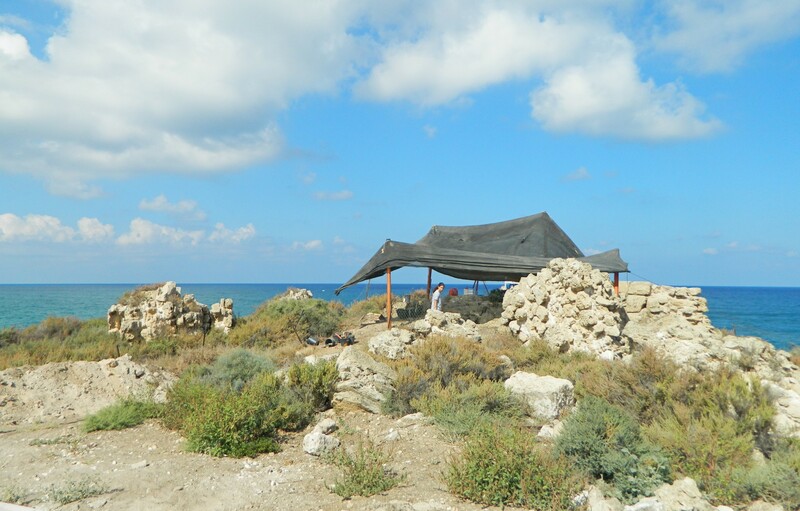 Following my last season at the Tel es-Safi/Gath archaeological dig (as can be read in parts I and II) a year later, I returned this summer for another four weeks of fun in the sun. Having garnered some experience, I was promoted to assistant area supervisor, which, in my case, made me a supervisor of five squares, a step up from last year’s single square. 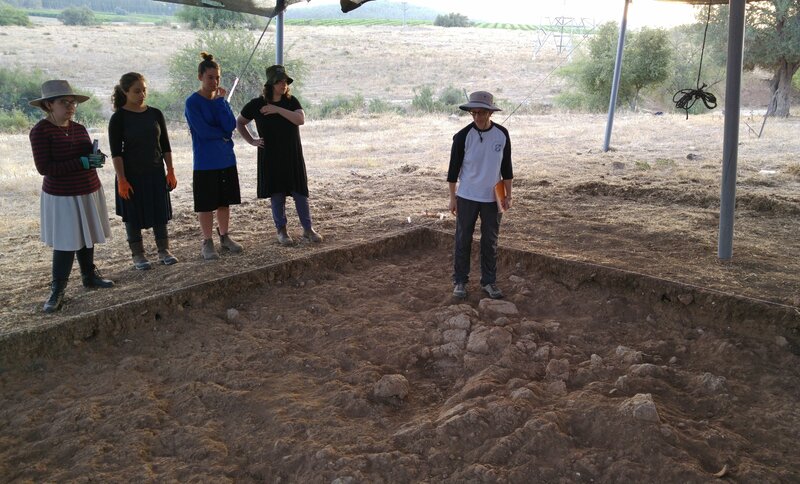 Excited to tackle the job, I reunited with Dr Jill Katz of Yeshiva University (my immediate superior), Prof Aren Maeir of Bar Ilan University (the dig director) and other staff members to prepare the field for the dig. 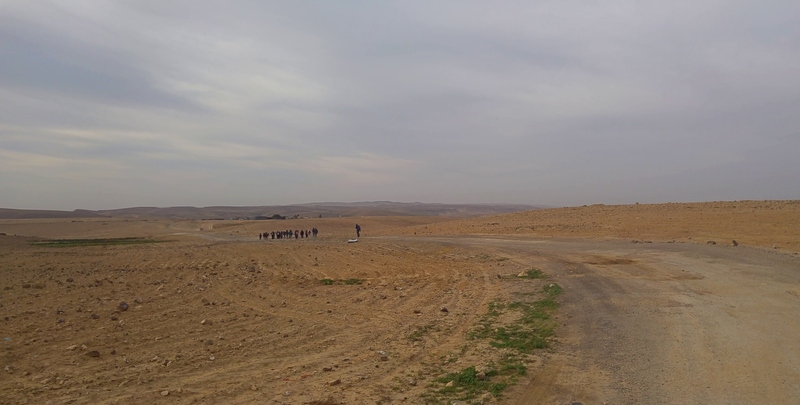 This year brought change to the long-running Tel es-Safi dig as the efforts were concentrated only on the lower city area. 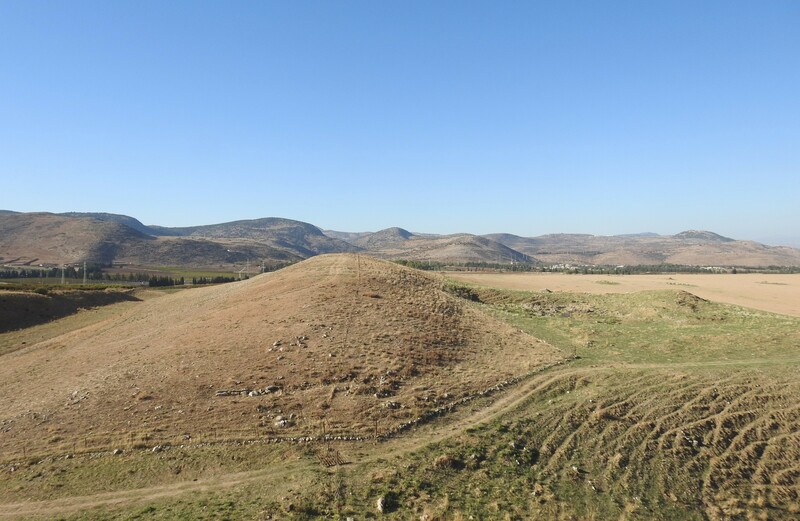 Last year had us in both the upper and lower city of the tel, with our Area J being on the slope – the upper city wall from the Early Bronze era. 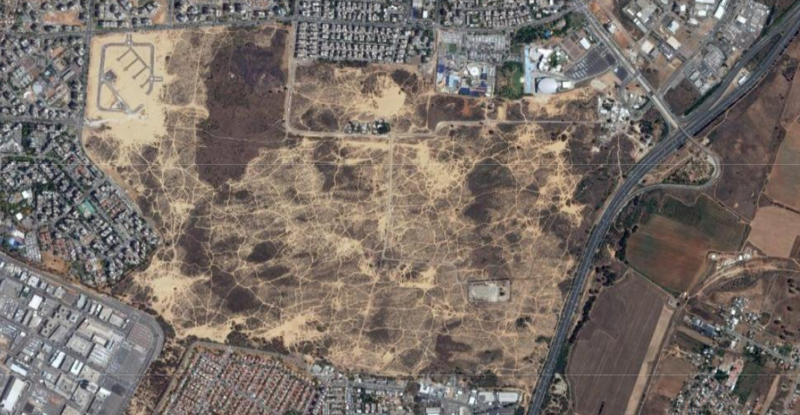 Dr Katz and I had been designated a new area, Area Y, at the northern side of the tel and close to Nachal Elah, the outer regions of the lower city. 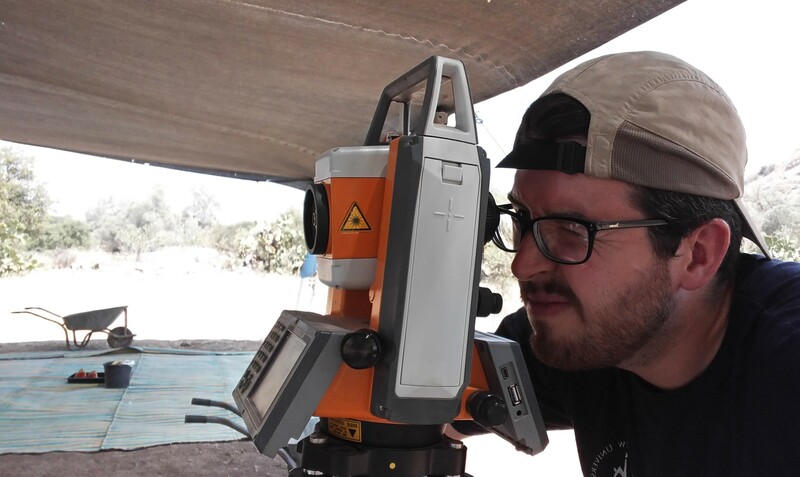 Using some nifty magnetometry technology to detect physical anomalies under the surface, we picked out some squares to excavate out of Israel’s national land grid. 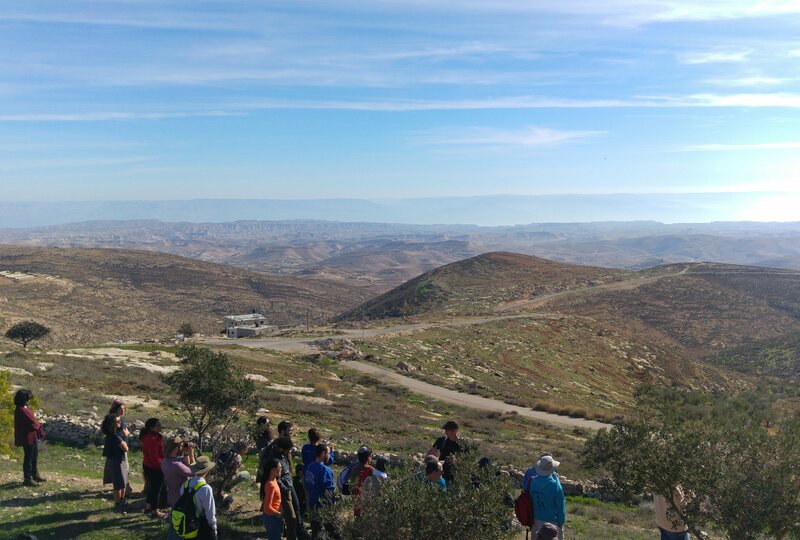 This year our expedition was to be based out of a school in nearby Kibbutz Kfar Menachem, just a fifteen minute drive from the tel itself. Staff and volunteers met and exchanged pleasantries as we set ourselves up for the four-week program. 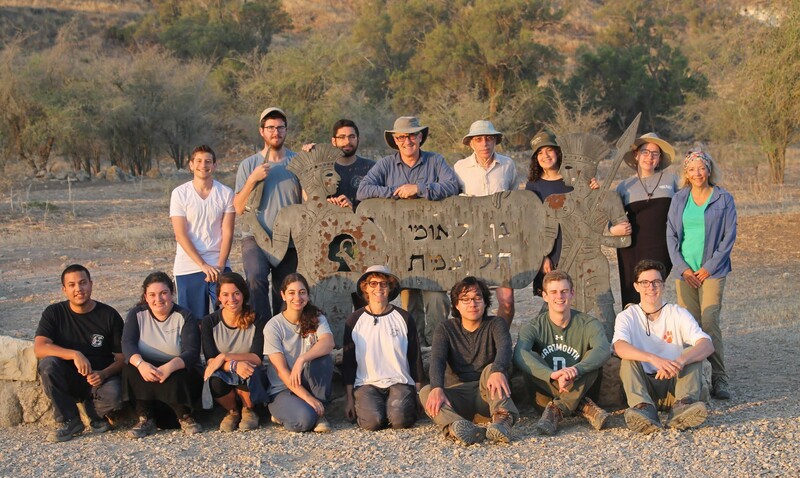 Dr Katz had brought some Yeshiva University students and other volunteers, which made the bulk of our core group, and it was a pleasure to get acquainted before setting out the following morning to the tel. Our first week began with clearing Area Y from rocks, dead grass and other vegetation, as well as setting up the shade tent that would serve us the rest of the season. 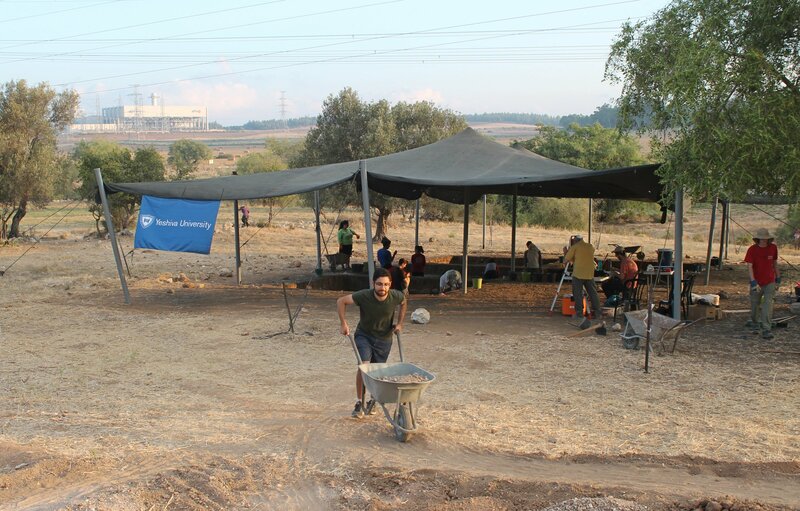 Our neighbours were also preparing their areas: the Bar Ilan team at Area M just across the dirt road on the side closer to the tel was also opening up fresh squares on virgin land. Over to the west, Area D and D2 were setting up as well, cleaning their aging baulks from the ravages of time and winter’s rains. Back at Area Y, we struck into the dry soil with a hunger for finds, each of the first four squares occupied by three or four volunteers. I was given boxes of supplies, a table, and a chair where I was to spend the majority of my time in the field. I was charged with making sure that everything was properly registered and accounted for, and that everything that was taken back to the field lab was tagged and labeled correctly. It was an interesting yet mostly cushy job and I was almost always shaded from the fierce sun by the large jujube tree that adorned the eastern side of our area. Each day the routine was the same: we’d arrive, set up the shade tent, gather all the necessary tools, have a quick briefing on what the objectives of the day were, dig, dig, dig, write, write, write, and then pack it all up at the end of the day, which was at one o’clock in the afternoon. Back at the kibbutz we processed all the finds, which included washing, reading, and writing on pottery, as well as attending lectures and filling out paperwork (each to their own in accordance to their job). Of course, we also enjoyed meals and had leisure time to fraternise with the many interesting folks from around the world who had come for the summer. Clearing away the topsoil is both laborious and frustrating, yet sometimes really interesting finds from more recent periods can be found. In our case, we found several pieces of Ottoman pipes and a few broken glass bracelet pieces from the Mamluk/Ottoman period. While these finds have very little significance to an excavation dedicated to Bronze and Iron Age settlements, they do brighten up the day. 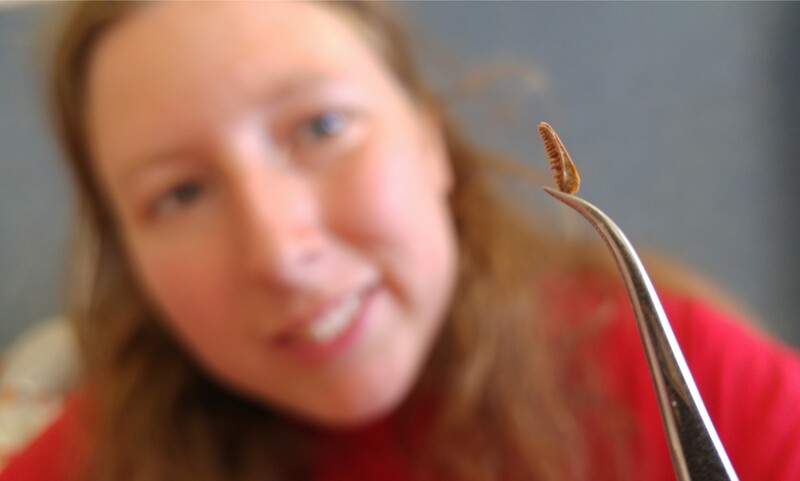 Being a lover of nature and wildlife, I was always excited to see interesting species both in and above ground. During the first week we found a few ocellated skinks and some green toads, while seeing a recurring presence of a pair of short-toed eagles who reside at the tel each summer. It’s always satisfying to hear an aquiline cry in the distance and to then looking out at where it was expected to be; I had begun to learn their habits and that provided me much joy as a birder. The first week went by quickly, the topsoil being stripped away and decanted on nearby dirt ramps that were constructed under the guidance of Prof David Kotter of Colorado Christian University, a man educated in the art of engineering. With the start of the second week our core team was bolstered by some experienced members from last year’s Area J, including Itamar Berko, Shani Guterman, Avraham Penso and Rebecca Zami. We needed more diggers with experience to manage all the progression made below topsoil–when things start getting interesting. In fact, in one of our squares (93A), a curious clumping of fired mudbricks was being exposed from under the earth, prompting much discussion amongst the staff. 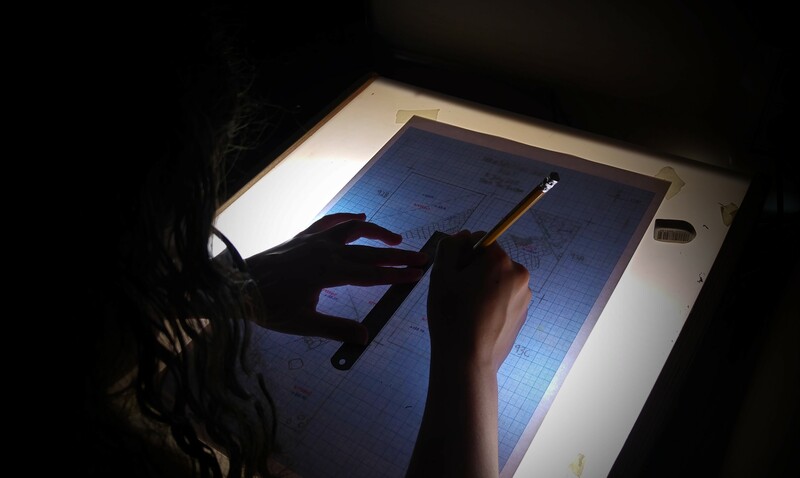 Each square had its charm, a combination of the physical contents and the personalities of those working in it. While one square’s team was hard at work pickaxing a mysterious layer of chalk in relative silence, another would be clamouring about some painted pottery they had found. Though not properly digging in any of the squares for the bulk of my day, I had the pleasure of appreciating it all, even if from afar. With the onset of the second week I had also brought some of my home-brewed beer to the kibbutz, the vulture-decorated bottles of our successful batch of Arx Meles IPA II proving to be quite a hit with both the local and foreign students. Unfortunately, my co-brewer, Ben Yablon, was unable to attend this year’s dig and thereby missed out on the accolades that he well-deserved. 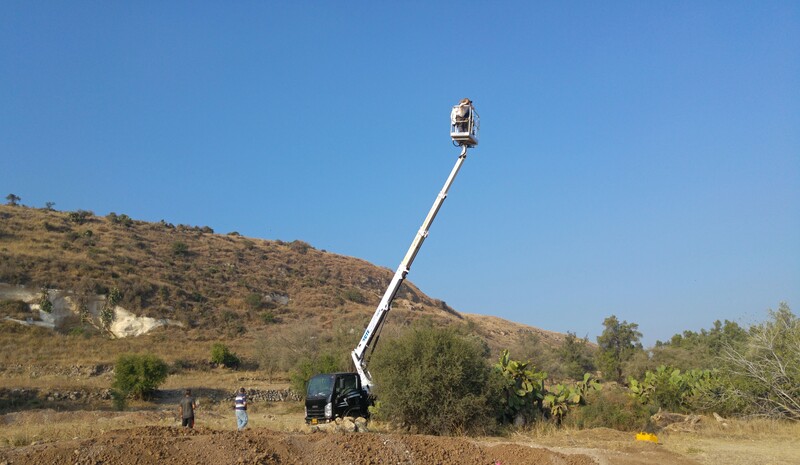 Back at the digsite, the expedition’s drone began to made sporadic visits to the three areas, providing us with a much-appreciated bird’s-eye view of the work we were doing. There wasn’t much in terms of isolated special finds during the second week, but the squares were coming along nicely, and some of them caused much intrigue. 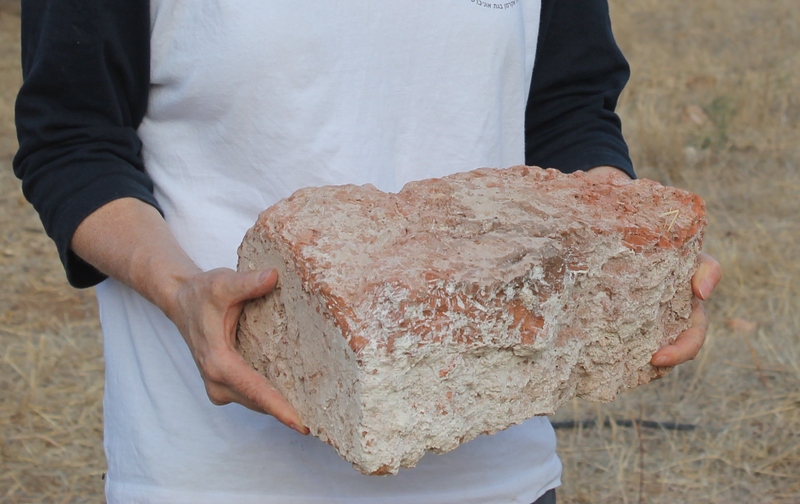 For one, the clumping of mudbricks in square 93A was beginning to appear like a structure, albeit somewhat collapsed, and the square with the chalk refused to move on – the chalk layer getting deeper and deeper with every passing day. It’d be uncharacteristic for me to leave out the wildlife, so on the second week I was treated to a special guest at my table. 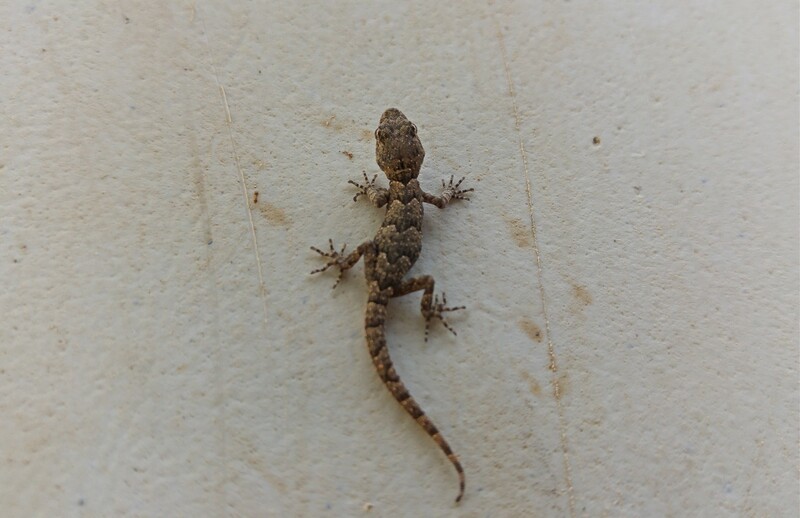 A tiny Kotschy’s gecko, that I assume lives in the jujube tree, came running all over my paperwork and top-plan. I had never seen one of these amazingly camouflaged lizards so it was quite an experience. Another curious find shortly thereafter was the remains of a little owl, found flat as a pancake in the grass beside the dirt road. I just hope it wasn’t the same little owl from last summer (see photograph HERE). 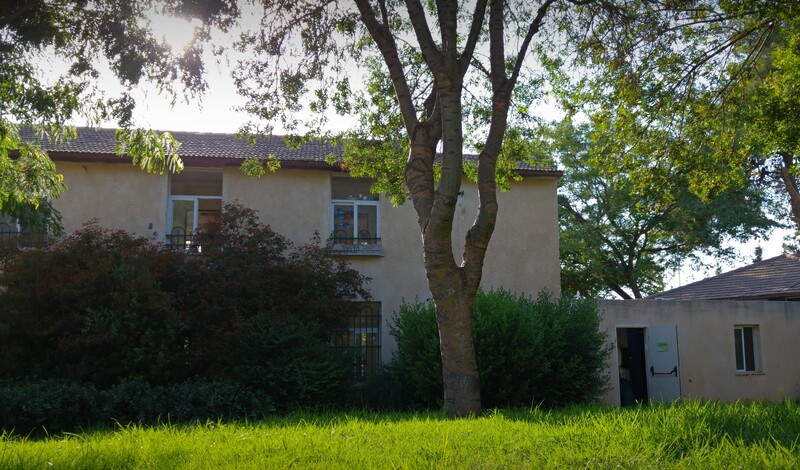 The second week went by quickly, and a handful of Bar Ilan students left our area. Our crew was cut down a bit, but on the third week we had a lot of volunteer groups who came to help for a day. 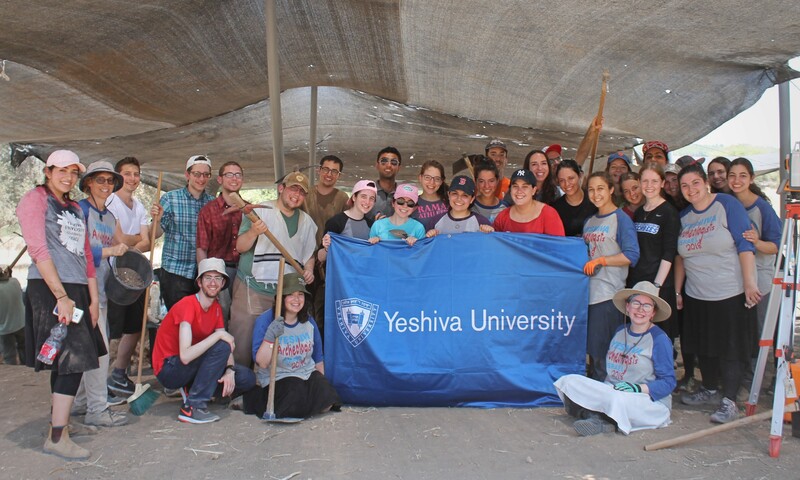 A large contingency of Yeshiva University students doing a summer program in Bar Ilan’s laboratories came to help out one morning, bringing with them a YU flag for us to hang from our shade tent. Good progress was made on the third week, and the squares were looking more and more impressive. In order to handle the influx of volunteers with no field experience, we opened up another square (93C) which provided a fresh working space for fun topsoil finds. Sure enough, a piece of a glass bracelet from the Mamluk/Ottoman period was uncovered, as well as a few obscure metal pieces probably dating back to the early to mid-1900s. 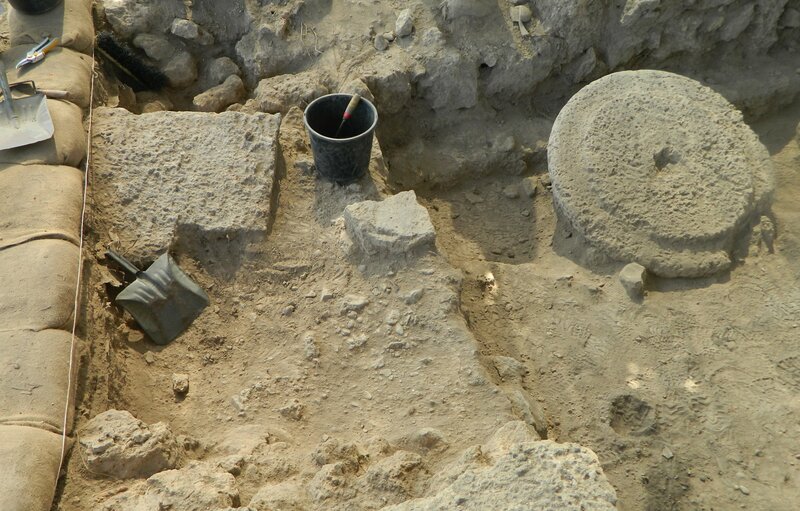 Despite the fact that we had five squares open, and that we were digging in Iron I territory (land of the Philistines), we had a remarkable lack of small finds. Even pottery, which is so common everywhere on and around the tel, was scarce and our daily pottery buckets were always scant. It became a bit of a joke during the expedition, especially as Area M’s findings were so incredibly rich. They had uncovered the destruction level from the Aramean King Hazael’s attack, and were knee-deep in both broken and complete vessels. We had to finish the bulk of our digging by the end of the third week, as the fourth week focuses on cleaning up the area and photographically documenting the season’s work. Most of Area D’s workers, including the valued CCU team who helped us out a lot in Area Y, had left the expedition by the end of the third week. Our team shrunk as well, and it was mostly the core members who were left to hold the torch to the very end. We came back from the weekend, some of us having spent Shabbat together in Jerusalem, refreshed and ready to finish off the season with a bang. However, I had a different calling. That Sunday I was to report to my old army base just outside of Haifa for reserve duty. Being that I was still tied down with my responsibilities at Tel es-Safi, I was released upon talking to my captain, but it was fun revisiting my old base after so many years. Taking public transportation back to the kibbutz, I rejoined my dig friends and got right back into the swing of things. 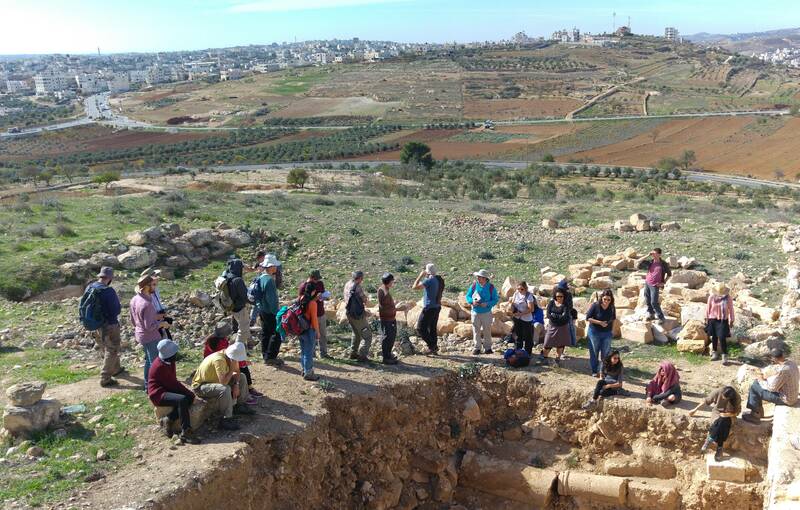 The following day we took a field trip to Tel Miqne/Ekron, guided by our very own Prof Jeff Chadwick, who was a supervisor there during the excavations in the 1990s. We toured the agricultural installations, which had since become impressively overgrown, and learned about the ancient city’s gates. It was a short trip, with the intense afternoon sun beating mercilessly down upon us, and we took what we could from it. The next few days were dedicated to cleaning and photographing, yet while cleaning, the base of a vessel became visible on the floor of Square 92B. 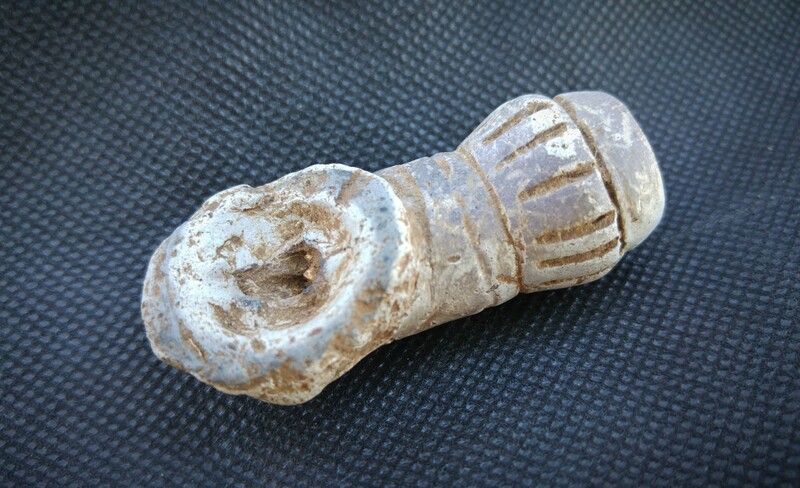 We were filled with excitement, thinking that we had at last come across a possible whole vessel. So, after taking the final photographs of the season, we gathered around as a few team members excavated it. Not quite what we expected, we discovered that this base was just a base, and a broken one at that. Later, we learned that it was a homemade vessel – a cool find for that reason alone. 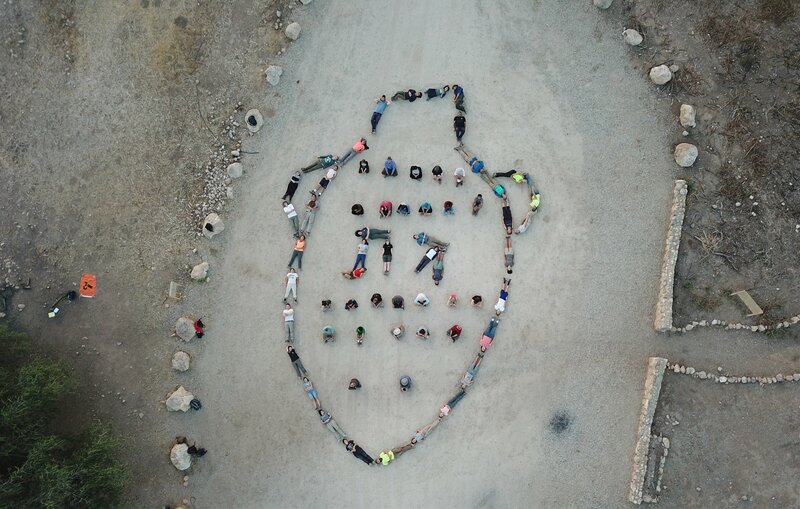 Thus ended the 2018 season of the Tel es-Safi Archaeological Dig for the Area Y team. We shared a grand time together, most having a once-in-a-lifetime experience that will be forever cherished. 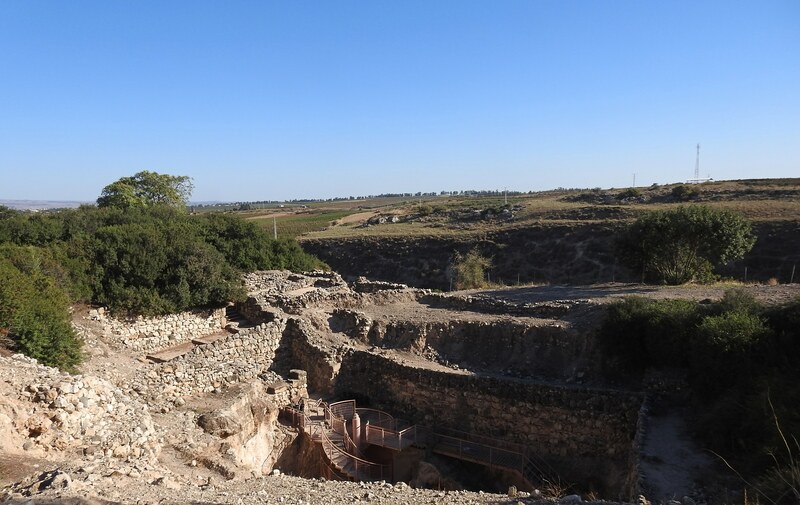 For the archaeology students among us, there’s next summer to look forward to – be it at Tel es-Safi again, or perhaps one of the many other archaeological digs throughout the country. 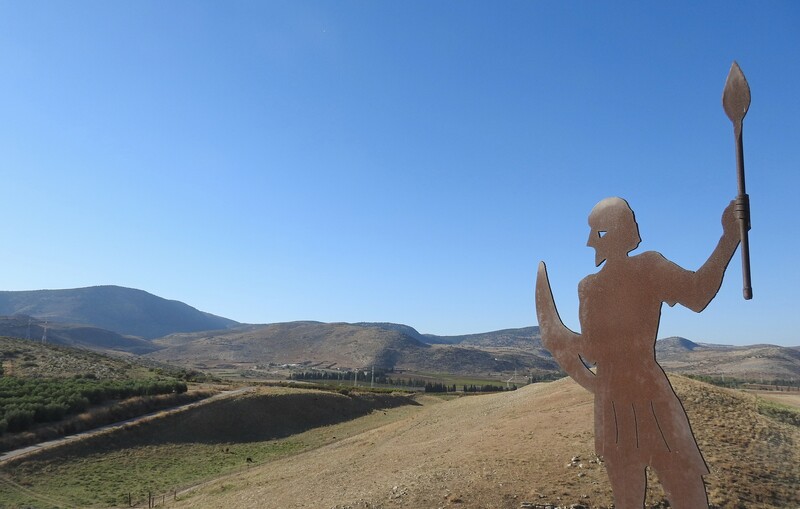 To read more about Tel es-Safi’s official (and unofficial) updates, as well as old posts from this summer’s season, please check out Prof Maeir’s blog HERE. 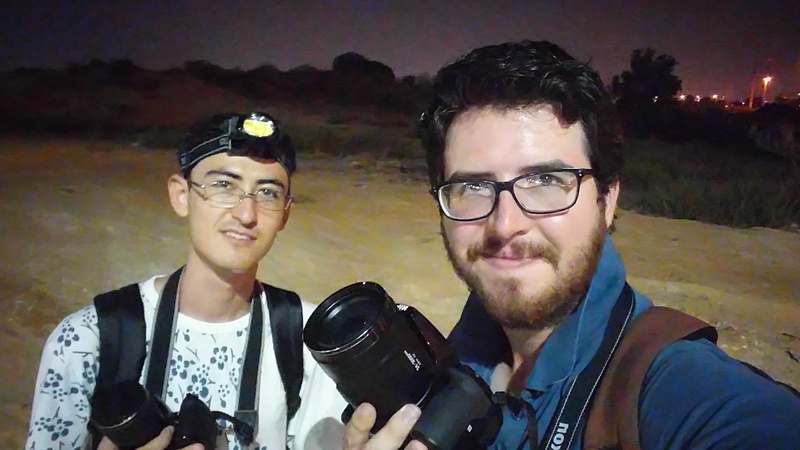 The Friday after the Bar Ilan University field trip to Tel es-Safi and the Museum of Philistine Culture I went on a nice birding trip with my friend Adam Ota. 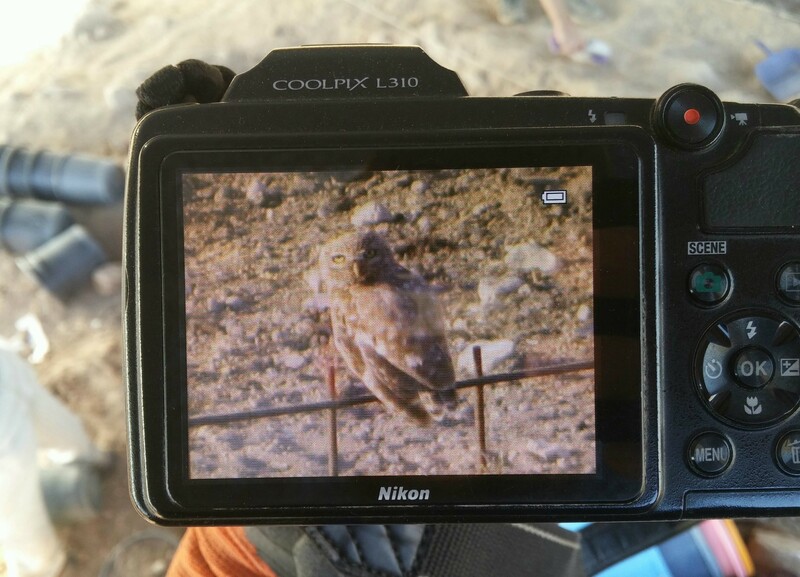 He had reported to me that the Tel Hadid and Ben Shemen Forest area had some great birding potential so we set out that morning in high spirits. On the bus ride we already began to reap the rewards of our trip with a sighting of a black-shouldered kite and a golden jackal. Our bus dropped us off at the northern entrance of the park and we were surprised to see a huge number of cars disgorging cyclists all around us. Apparently there was a cycling event in the forest that day, and we just prayed that their presence wouldn’t interfere too much with the birding and nature-watching. Armed with our cameras and exploratory spirits we began our tour of the forest, deciding to start from the northeast corner and working our way southward. From the very start there was a member of the falcon family making appearances, yet refusing to allow us to get a good photograph. 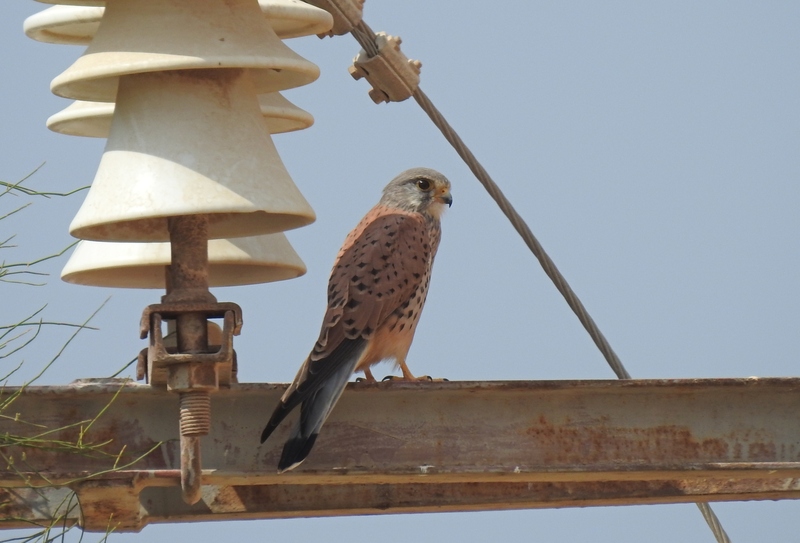 It was probably a common kestrel, but Adam had spotted a hobby nearby the previous week so we were keen to see one. Circling a field that yielded no interesting species, we ignored the plentiful Eurasian jays and entered the woods. It wasn’t long after starting on a dirt trail and encountering many cyclists that we decided to go offroad a bit and try our fortune there. We had picked the perfect place to explore, for we had come across an ancient stone quarry, the clean cut marks being a clear indication of human activity. But there wasn’t just stones to look at, Adam had found a distinct-looking flight feather which once belonged to a barn owl. 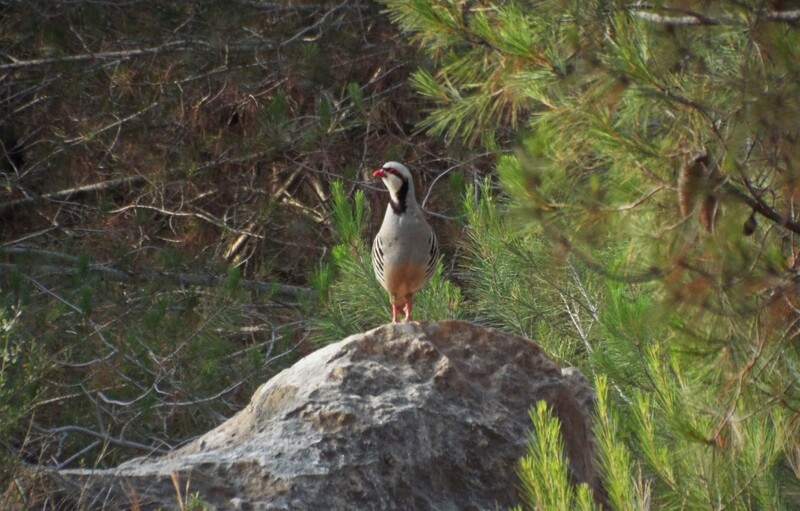 While we were traipsing through the piney undergrowth we were brought to attention by the call of a male chukar, a species of partridge common to Israel. We stood stock-still and scoured our surroundings, trying to locate the sound. At last, after some silent stalking, Adam succeeded in finding the chukar, perched up on a boulder and providing us with a great sighting. Some songbirds, including the frequently-spotted Sardinian warbler, put up a good show and then we moved on. 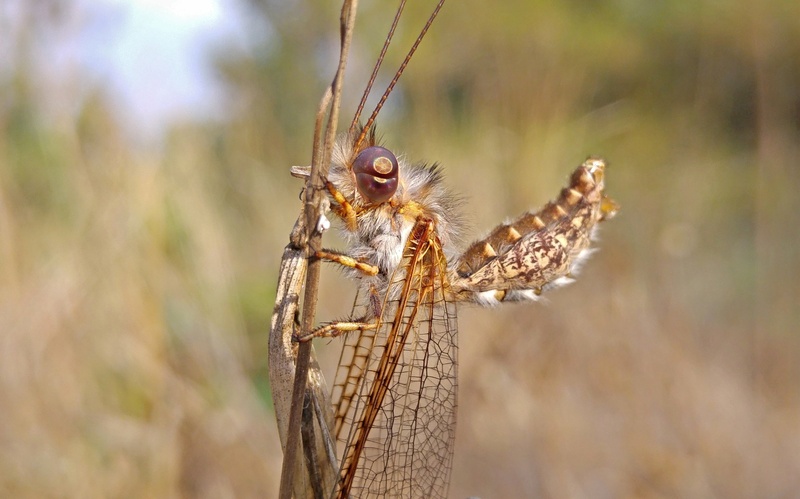 We next found a few Polyommatus genus butterflies and then Adam stopped our progress through the grass to take a photograph of an adult owl fly (Bubopsis andromache), a close relative of the antlion. 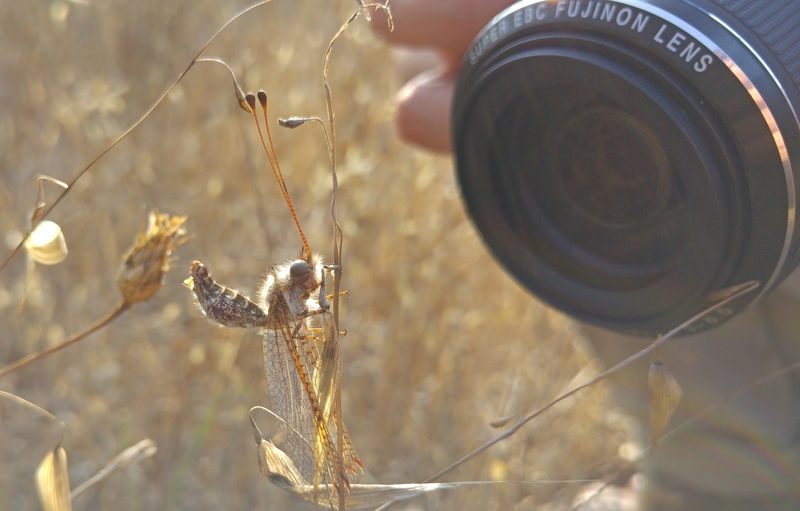 I joined in on the party and the owl fly stood motionless on a stem as we took dozens of photos with the different photographic devices we carry. 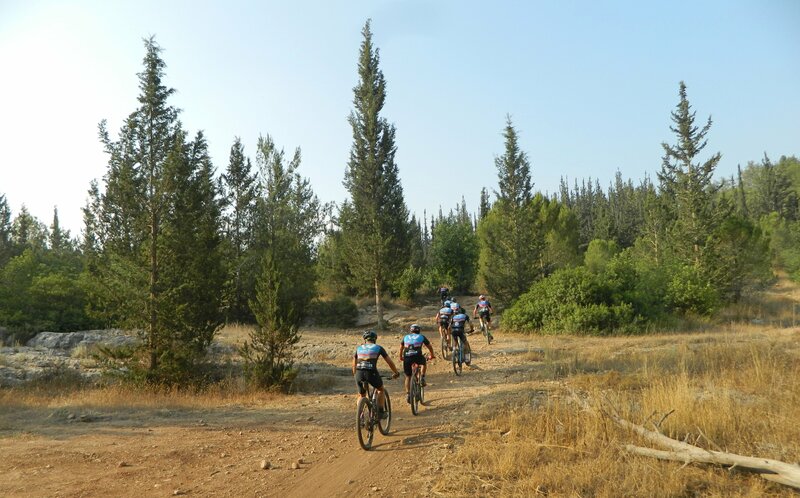 From there we headed further south, towards the dry streambed of Nachal Gamzu, and encountered even more cyclists. Eventually we caught sight of a bird of prey passing by overhead, identified as a short-toed eagle – quite common in Israel during the summer months. Reaching the southwest corner of the forest we made our way towards Tel Gamzu, which was to offer more than just a nice view. We approached the hill from the east and climbed it, the change of landscape scenery giving us new hope for interesting species. 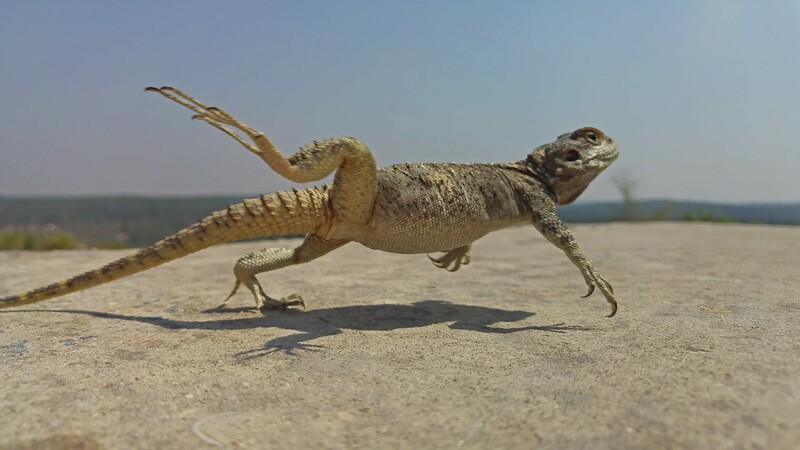 True enough, Adam caught an agama lizard that had run into an old military bunker and released it back into the wilderness after a few photos. 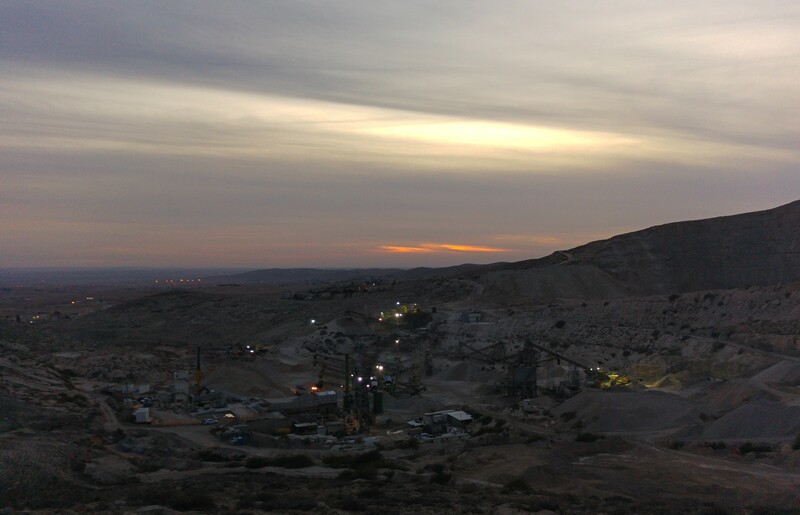 The tel had started as an Bronze Age settlement and then, in modern times, served as a strategic point for IDF soldiers during Operation Danny in 1948. Atop the tel we found a nice lookout over the coastal plains and sat down to lunch, a pair of common kestrels and a handful of bold mynas keeping us company. When we had finished our break we continued back down the hill, stopping to watch a group of people with their 4×4 SUVs engage in some off-road fun. 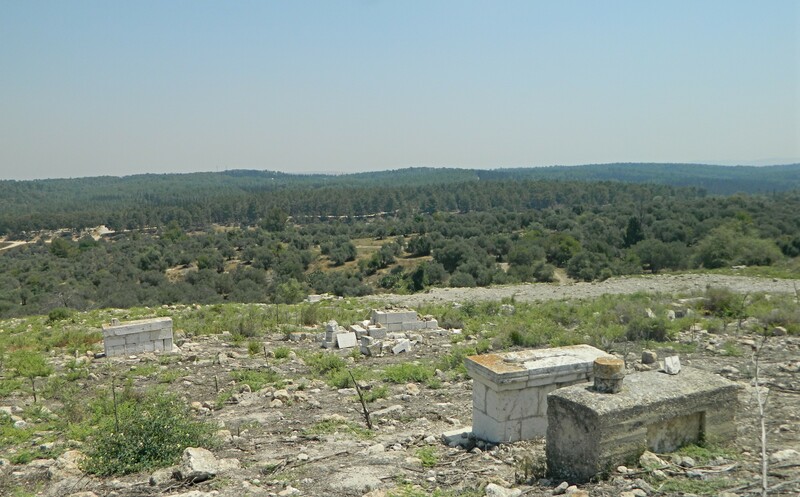 Descending via the northern slope, we passed through the abandoned cemetery that belonged to the Arab village of Jimzu (which preserved the ancient name of Gamzu) and then found ourselves walking alongside olive trees. At one point, while we were poking about looking at huge funnel spider webs, Adam had a bit of a run-in with a sleeping jackal, which dashed off into the wilderness to never be seen again (by us, at least). Getting back on a proper trail, we passed a couple on horseback – this forest drawing humans on all forms of transportation – and then found something cool. On the side of the trail we found rock-hewn graves, each comprised of two burial chambers excavated on either sides of a coffin-shaped hole in the rock. I had seen these exact grave types nearby at the “Graves of the Maccabees” with Dr Eyal Baruch so I knew how to identify them – particularly the fact that these weren’t Jewish graves. 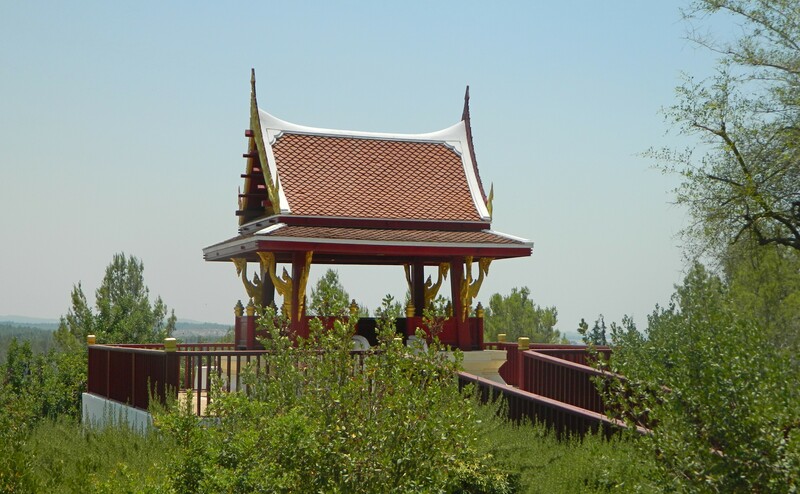 Moving on, we next encountered a fenced-off ornate pagoda built by the government of Thailand in honour of Israel and Thailand’s King Bhumibol the Great, who died two years ago. Impressed by the structure we took our leave and headed for the park’s entrance, near where we had entered several hours ago. 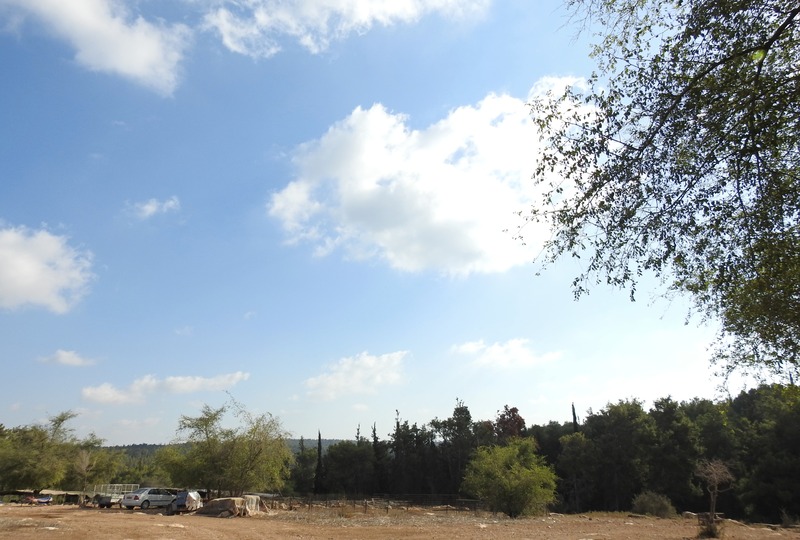 We found a lookout tower and took a short break before heading off to the bus stop, stopping along the way to buy freshly squeezed juice to revitalise us, thus bringing an end to our nice tour of Ben Shemen Forest.